It has been a while since my last blog update, and much has happened. It takes a lot to get me off Kangaroo Island these days, but I did manage work on three very diverse film projects. The Nightingale would have me collaborating with director Jennifer Kent once again, who I had shot stills for on her phenomenally successful first film The Babadook. Shooting in some stunning Tasmanian landscapes, the period film, set in 1820’s, featured some incredible performances from its fine cast and I am sure will make for an intense cinematic experience. 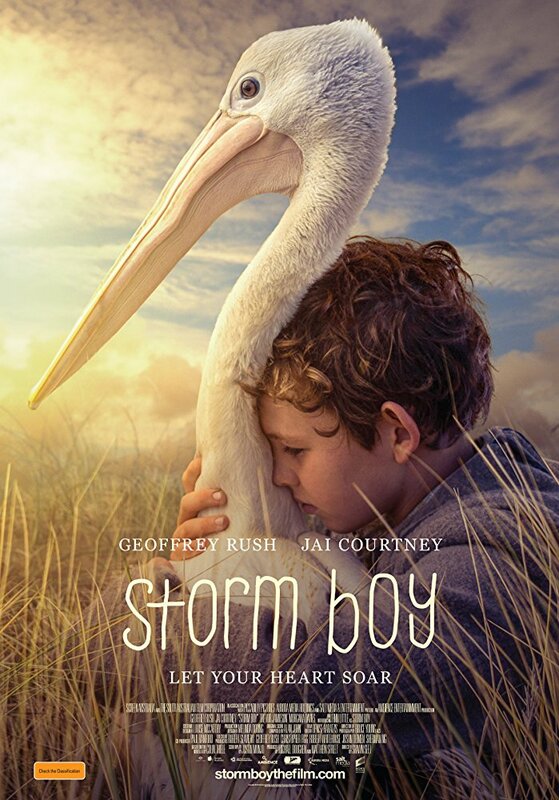 Closer to home, Storm Boy, the retelling of the 1970’s Australian classic, had me working in the beautiful Coorong region of South Australia. A crew full of old friends, the stunning coastal landscapes, remarkable trained pelicans and a stunning performance by 12 year old lead actor Finn Little making for a another good film making experience. Completely different in every respect, I Am Robot, shooting in the Adelaide Film Studios, was a futuristic sci fi thriller with incredible sets and starred a very cool robot designed by New Zealand’s WETA group along with US actress Hillary Swank in a leading role. Hillary Swank in I Am Mother. 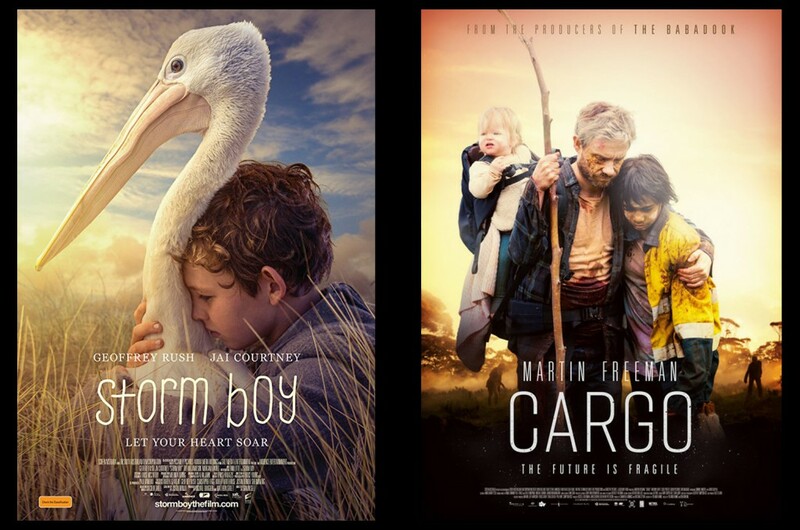 Storm Boy and Cargo movie posters featuring my photographs. Practising and teaching yoga has become a central part of my life in my late 40’s. As my teacher experience grows it has become apparent to me that teaching yoga to children is what really lights me up, and challenges me enormously at the same time. 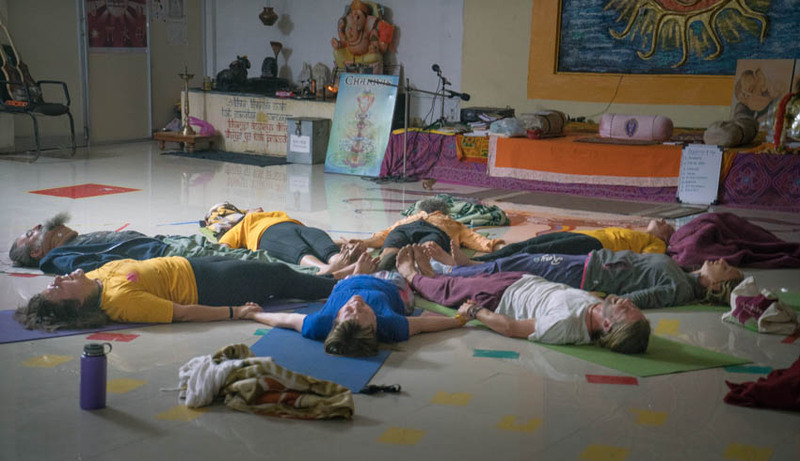 In January I returned to Indore, India to undertake my next level of your teacher training. For the second time I lived at Paramanand Institute of Yoga Sciences for a month, undertaking an intense period of study and practice under the wise guidance of my mentor and guru Dr. Omanand, Guruji. 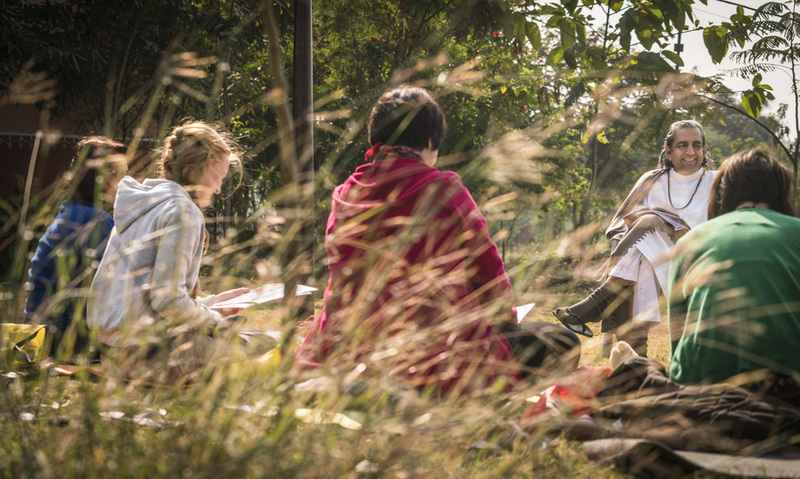 Guruji teaches international students at Paramamand ashram. 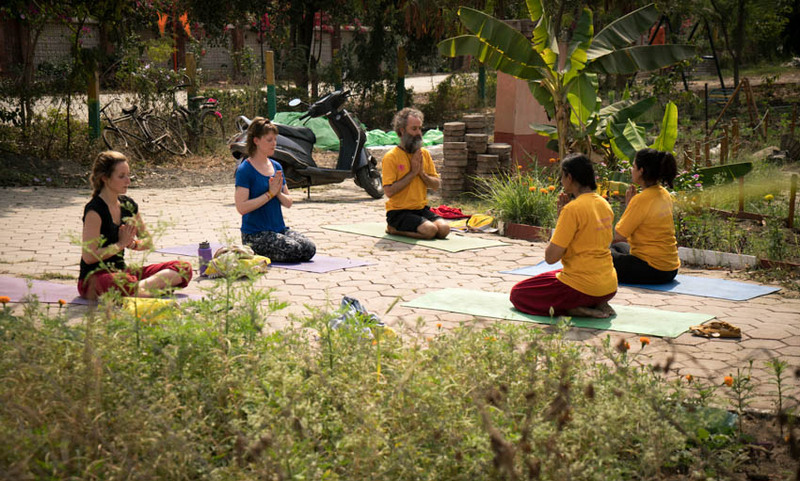 The presence of Dr. Nick Perch at the ashram was an added incentive to go. I had met and connected with Dr. Nick, a Ukrainian medical doctor as well as a doctor of Yoga, on my initial visit to the ashram. 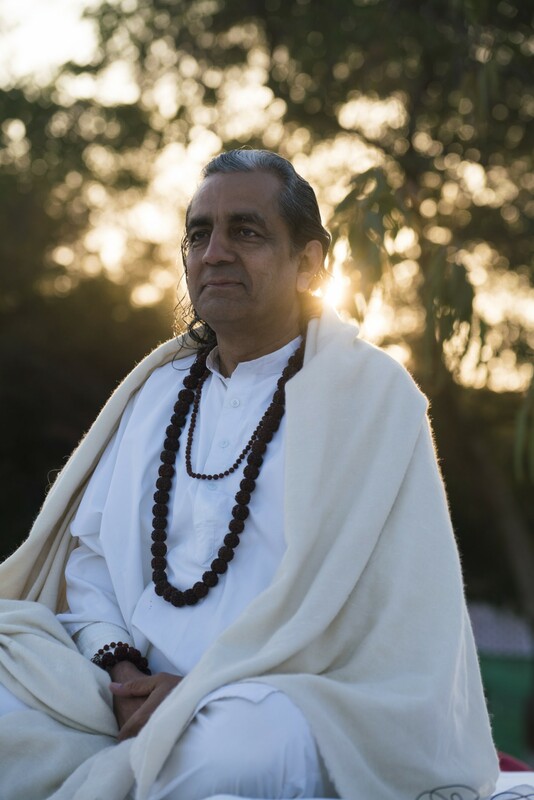 On top of completing his doctorate on the benefits of yoga for children, a shared passion, we connected deeply on a musical level, enjoying many sublime Bhakti Yoga sessions, devotional singing. Dr. Nick Perch and I in a Bhakti Yoga moment. January would prove to be a busy time for our teacher Guruji as he is much in demand internationally and throughout India as a yoga master and motivational speaker. I was one of a few students who were invited to join him on some of his trips, which were always an unpredictable adventure. This gave me the opportunity to see more of India than o my previous visit. There were epic overcrowded car journeys to distant cites, overnight trips on freezing sleeper busses to mystery events, a yoga class for 700 hundred police cadets at dawn and joining 7000 kids in breaking the sun salutation work record, 1 million!. Travelling with Guruji felt a bit like travelling with Elvis; adoring fans would overload him with garlands and fall at his feet in reverence, escorts in and out of the city. As his entourage we students were also given the royal treatment. 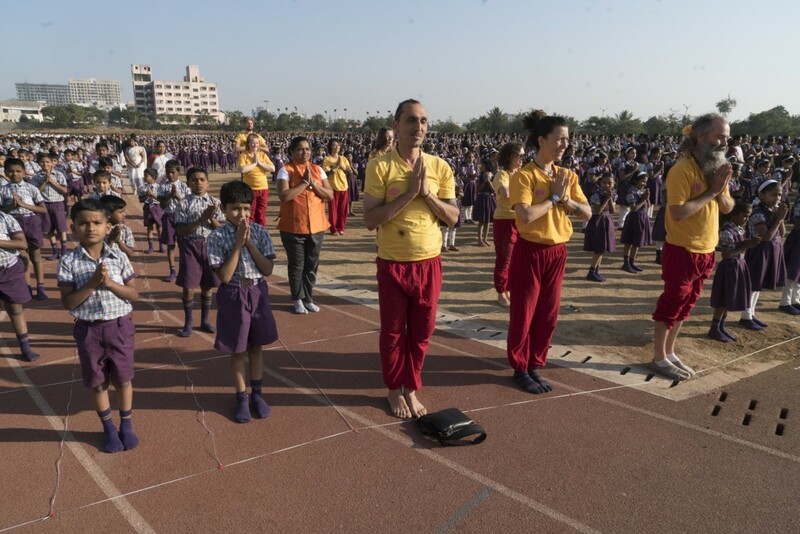 Myself and other Paramanand Yoga students joining 7000 Indian kids for the Sun Salutation world record. 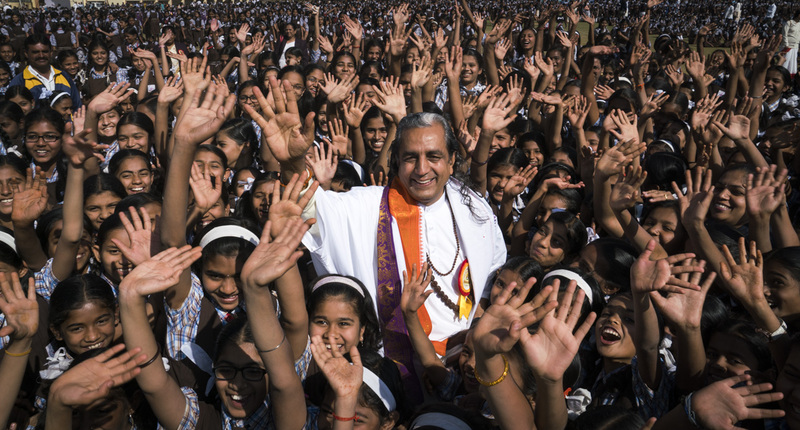 Guruji swamped by adoring Indian kids after their successful completion of the Sun Salutation world record. Once again, my this period of study was s a deeply transformative, as I qualified with my 300 hour teacher levels and had many amazing experiences. India seems to be reluctant to let me me go. Last time a Visa oversight had forced me to miss my flight and spend a stressful and expensive 24 hours sorting out the mess. This time a sudden bout of food poisoning at the airport tried to prevent me from boarding my flight. Determined to get home I took my seat for what would be possibly the most uncomfortable and humbling 7 hours of my life. Afternoon yoga class on the lawn at Paramanand Institute in Indore. My work as a stills photographer was very well represented in an exhibition called Starstruck put together by Australia’s National Portrait Gallery. The exhibition looked at movie set portraits throughout the history of Australian film making. I did several interviews for the show, had one my images used on the poster and book as well as eleven images in the show itself. The exhibition opened in Canberra and travels around the country throughout 2018. 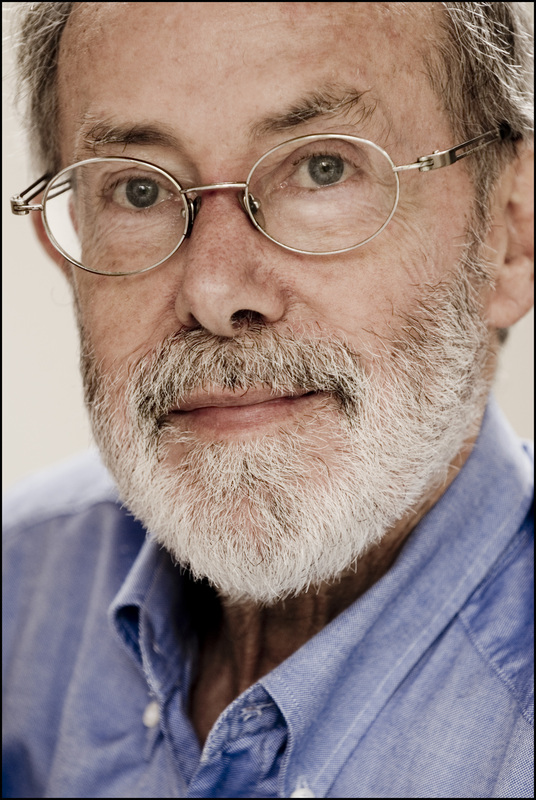 My wonderful father Professor Robert Garth Nettheim died in February, shortly after his 85th birthday. I have always been very proud of my beautiful dad who I loved dearly. A tender and caring father, an interesting, highly intelligent, funny man and an outstanding teacher and activist. 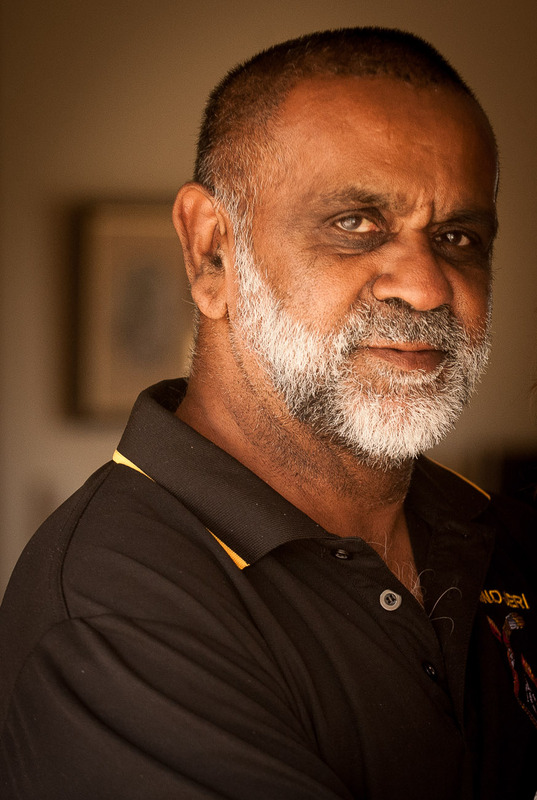 Throughout his career as a law professor he was a champion of human rights for indigenous people and had done some seminal work in forwarding the rights and restoring the land rights of the original Australians. 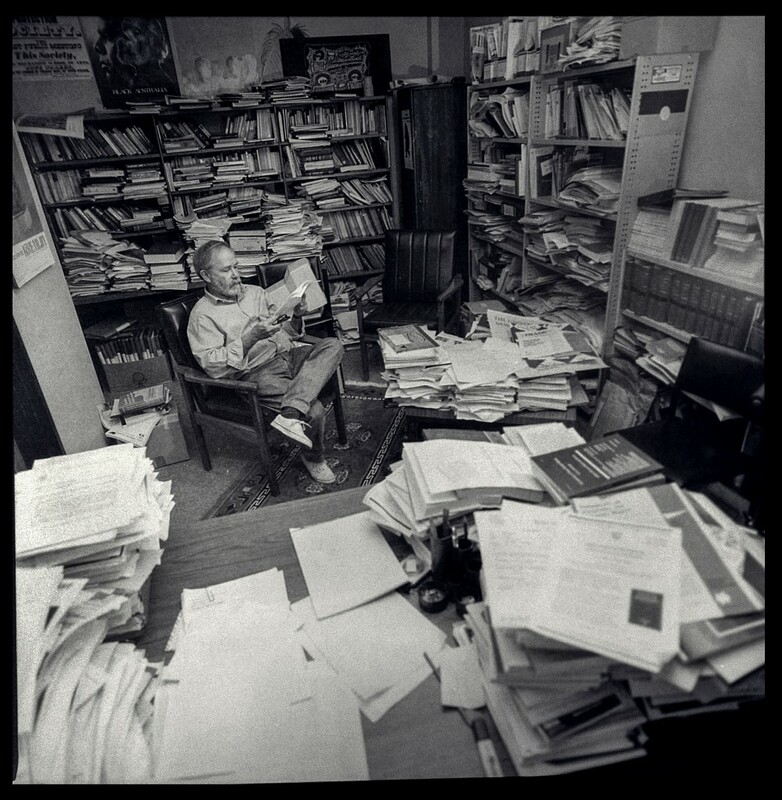 in his office. Law faculty UNSW 1992. It had been a long goodbye over a few years, my sister Anna had been outstanding in supporting him in Sydney in his declining health. My regular visits to Sydney to spend time with him had brought our family closer together and the intense and emotional process of organising his funeral with my siblings was an honour. Many beautiful tributes flowed in from friends, former colleagues and students and from the many people touched by his important work. A lovely obituary was published in The Sydney Morning Herald, the newspaper he had read daily his whole life. I picked up first prize in the Kangaroo Island Easter Art Competition with a basket weaving dedication to my father. Called The Life of Professor Garth Nettheim, the work marked a departure from my usual baskets and rattles as I explored story telling weaving around the theme of life and death. Starting at his birth, I used photographs and memories to feel into all the different stages of my dads life as the basket grew and evolved, the completed weaving over 5 foot tall. The finished work definitely had a sense of having my Garth’s spirit, a interesting organic shape that seemed to moved of its own accord. The Life of Professor Garth Nettheim. My winning weaving from Kangaroo Islands Easter Art event. Having travelled and studied in India and cremated my father in Sydney, I settled into a restful period at my beautiful place on Kangaroo Island, a chance to integrate the teachings I had learnt and enjoy my backyard beach in the warmer months. In May, it was great to get asked to teach yoga to the children at 2 of the islands schools and have the opportunity to practice what I had learnt. Integrating laughing yoga practices as well as traditional Hatha, mediation and pranayama, I am currently teaching the entire school at Penneshaw, including the teachers, and two entire classes at Kingscote. It has been challenging and fun to design a 8 week course for my students and the early responses and feedback from the kids and teachers has been very positive. It still amazes me to have 80 Australian country kids of all ages sitting in meditation, completely silent for several minutes and then see them float peacefully out the door. It is just such wonderful work. 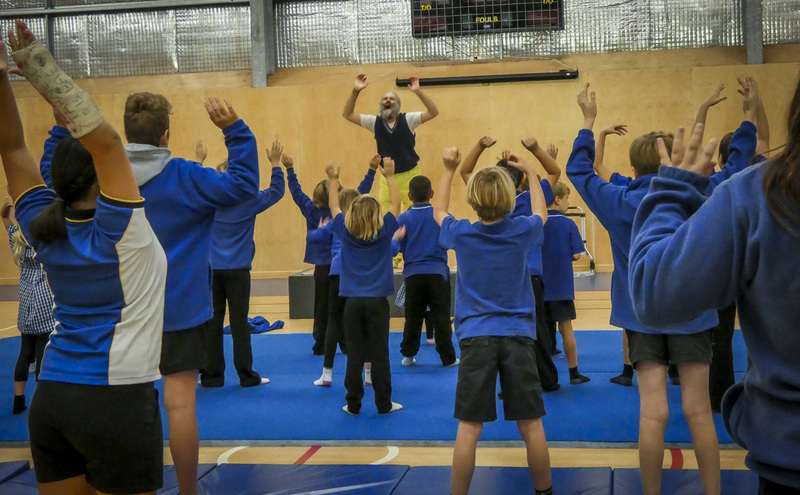 Laughing yoga with the kids at Penneshaw Primary School, Kangaroo Island. 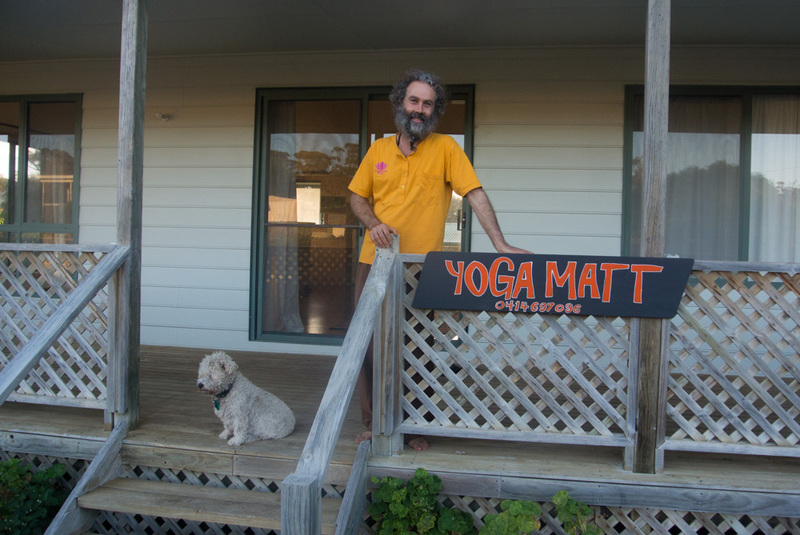 Within a month of returning from India as a yoga teacher I opened my first yoga studio in an unoccupied house on my street, and called it YOGA MATT. A small flyer drop around my community and word of mouth attracted a group of local students to my space, that really could only accommodate 6 or 7, most of who would stick around to become my regulars. My initial classes were free, allowing me to develop my teacher style and confidence, and then payment was made by donation. My students seemed to appreciate the traditional and spiritual style of my teaching practice, incorporating prayers, pranayama, meditation and even Bhatki Yoga, devotional singing and playing musical instruments. My first yoga school, taking over a vacant house on my street. With my confidence building as a yoga teacher I approached my local primary school in Penneshaw and offered my services there. The schools caring and progressive headmaster, Leanne Woods, embraced the idea and found a small amount of funding to get me started. I was allocated 2 groups of 6 boys from the senior and junior classes of the tiny rural school, and teaching this age group presented many new challenges for me. Incorporating games, juggling and hacky-sack into my warm ups, the kids supplied the music, and after my initial nervousness I quickly grew to love these classes. 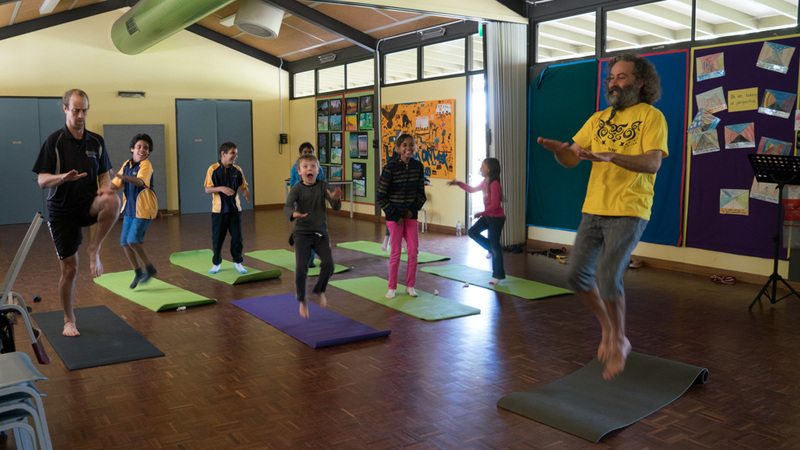 Yoga teaching kids at Penneshaw Primary School. Although I have played piano my whole life and performed in numerous bands I woke up one day with the strong desire to start performing solo. I contacted my local pub, the Penneshaw Hotel, and using my yogi name Madhav, debuted in the front bar on a busy Friday night. Dressed in my “magic” colorful striped jacket I went on with the intention of putting on a show, and really put my heart into it. Performing only my original songs, I included some extra drums and percussion in my kit and invited the audience to get involved, which a few people did. This interaction would become the format of my following shows which took place at the local market and True Thai restaurant. Trying to describe my music and show to other people, the best I have come up with is Peter Allan meets Kurt Cobain. 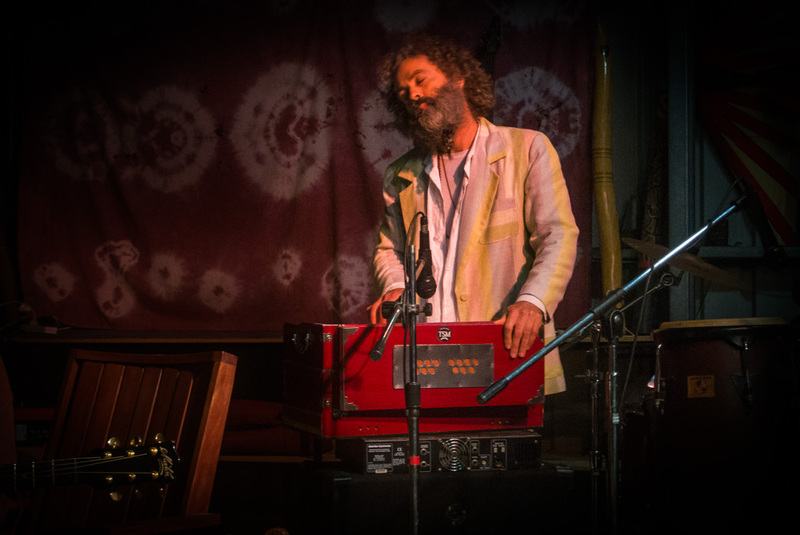 Madhav performing on the harmonium at True Thai Restaurant, Kangaroo Island. My partner Ky was due for a break from her demanding work as an Arts Therapist, and needing some inspiration, so she organised an overseas trip to the USA and Japan. I joined her and her son Yeshe on the adventure. Starting in San Francisco we went straight into a week long Art and Life retreat at the Berkeley Shambhala centre. 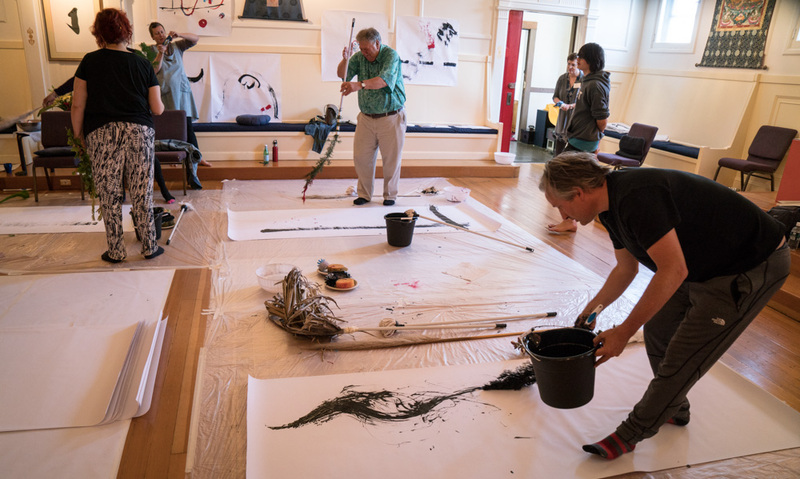 The program explored the creative teachings of Buddhist master teacher Chogyam Trungpa and amongst another creative techniques we explored calligraphy, object arranging, blind drawing and physical movement, mixed up with a healthy dose of meditation. After this we spent a week on the Idaho /Washington border visiting a friend for what was an interesting taste rural America. Art and Life retreat at the Berkeley Shambhala center. Exploring calligraphy with natural objects. In Japan we had 2 amazing weeks in the beautiful city of Kyoto staying in a traditional house. Despite intense heat our days were spent exploring the city on bikes and eating beautiful food in the many tiny cafes and restaurants. Moving to the north island, Hokkaido, we spent another two weeks in the densely forested town of Nukibira, a ski town famous for its onsens (natural hot baths), the boiling mineral rich waters which are pumped into all the towns hotels. Bathing daily naked in these baths with the locals had some deep healing effects on all of us on a number of levels, and it was great to be close to nature again after the time spent in big cities. At one point we were flooded in the result of a series of typhoons sweeping through the region. Our accommodation in Nukabira, Hokkaido Japan. Returning to Australia I went straight into my first job as a stills photographer for almost a year. 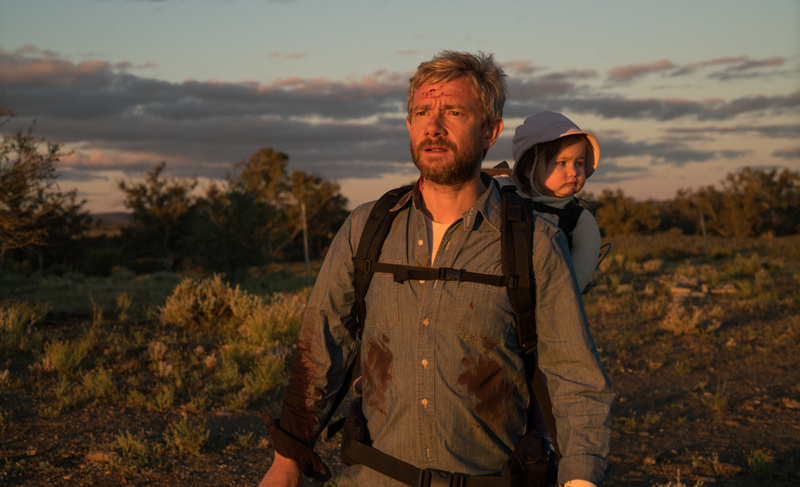 Staring UK actor Martin Freeman, Cargo is a feature film, of the zombie genre, set in the Australian outback and written and directed by Yolanda Ramke and Ben Howling. Leigh Creek in remote South Australia where we were shooting as about as far as you can get from the densely forested mountains of Hokkaido Japan, but once again I was flooded in as unseasonal cold and rain caused havoc for the production throughout the shoot. Cargo. Martin Freeman in outback South Australia. Whilst in Leigh Creek, and with a few days off, I contacted the local primary school and offered my service as a yoga teacher. The school counselor Jayne Martin jumped on the opportunity and I was assigned 6 kids who I had the opportunity to work with on two occasions. It is hard for me to express how gratifying it is to pass these teachings on to kids in rural communities, and seeing the health and confidence that yoga and mediation, not to mention correct breathing, can offer this generation. This work really lights me up and I can see it becoming an important part of my unpredictable life direction. 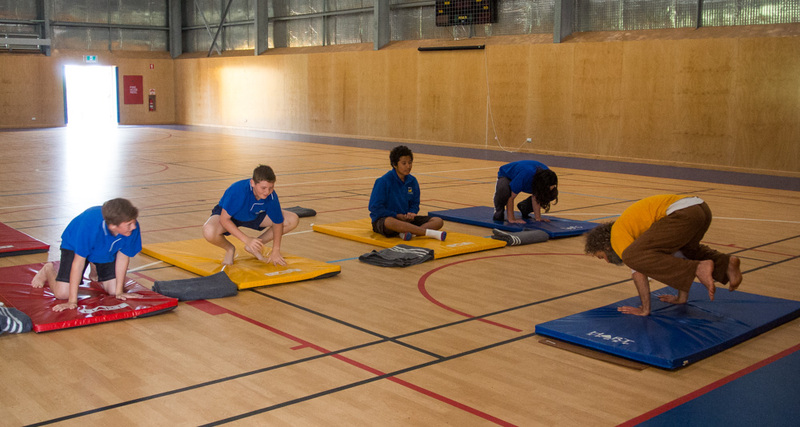 Yoga teaching at Leigh Creek Area School, South Australia. Things can get very interesting when you trust your instincts and follow your sense of attraction. Last month exactly this took me to an Ashram in Indore, central India, called Paramanand Institute of Yogic Sciences. I lived there for a month, a period of deep learning and transformation, and I left with so much more than a yoga teacher qualification. Rediscovering yoga 4 years ago, an interest quickly became self motivated daily practice, encouraged by the physical and mental health improvements I was experiencing. 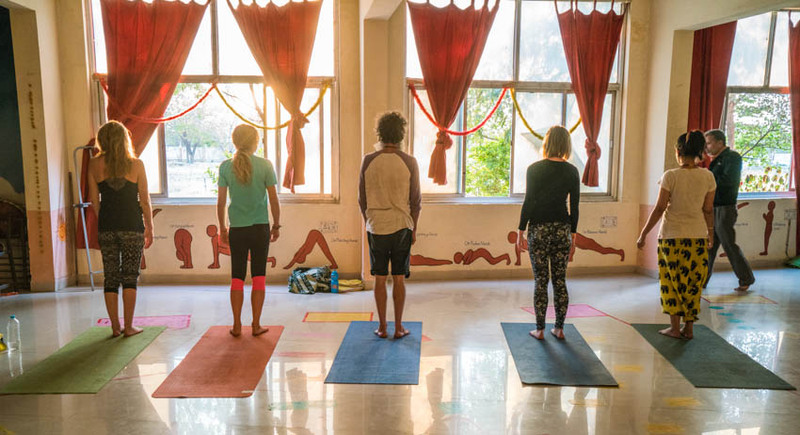 The idea of being a yoga teacher had occurred to me, and when I heard about the idea of training in India, and about this particular school, it just felt right. The streets of Indore, India. 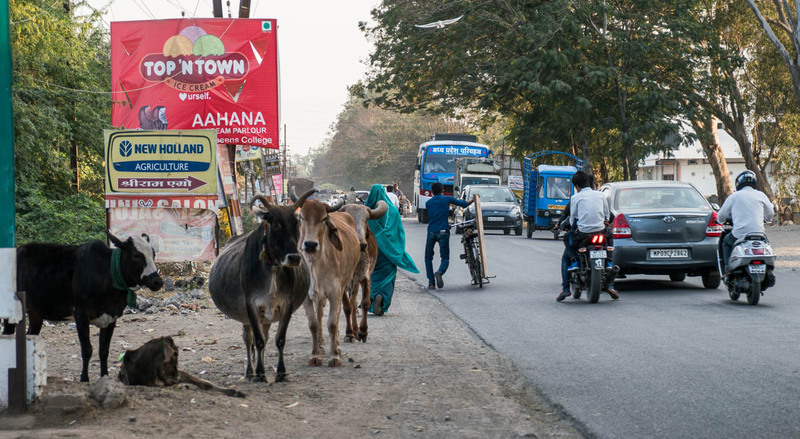 I had never been to India before, and driving through the chaotic streets of Indore from the airport to the ashram, families of 5 on a single motorbike dodging cows on the freeway, was an eye opening experince. 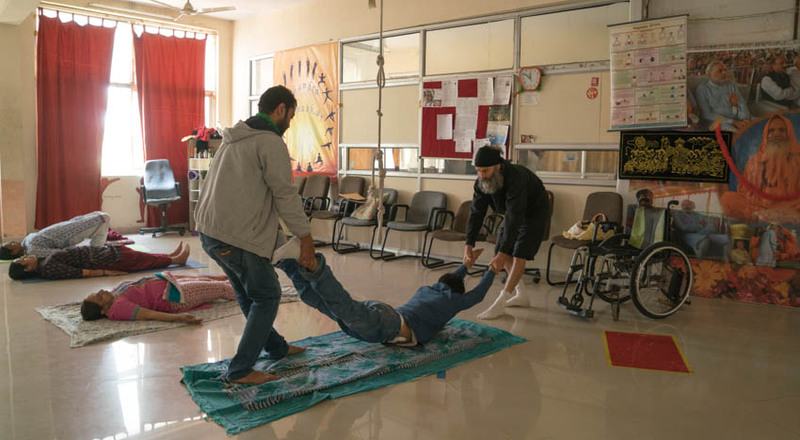 The Ashram, although close to the city, sat on 6 acres of land busting with organic crops, an injured cow nursery as well as temples, a monastery and age care facilities. 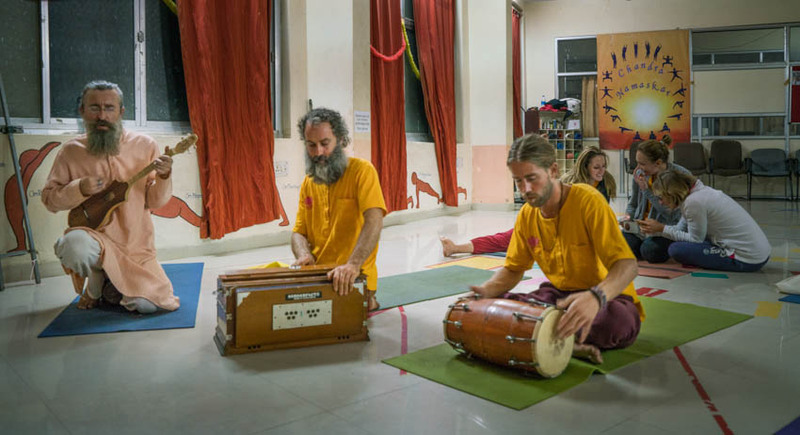 My roommate Ramon, from Holland, was going into his third month at the Ashram and although already a qualified yoga teacher was in no hurry to leave. We became good friends over the time sharing many amazing experiences as well as a prolonged bout of street food poisoning. 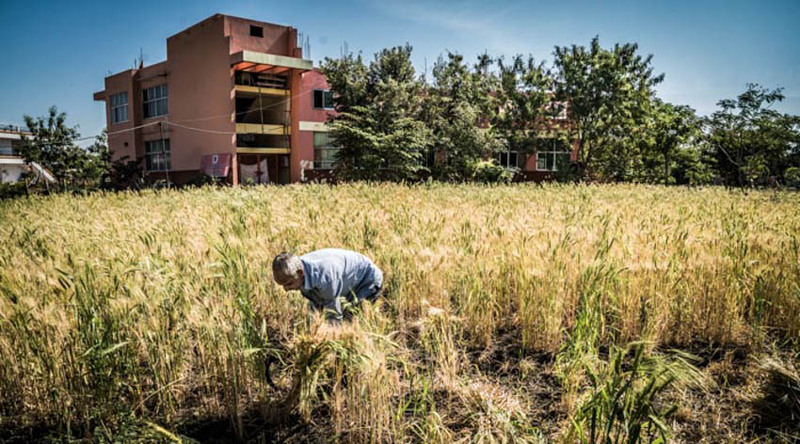 Organic wheat being harvested by hand from the surrounding fields of Paramanand Ashram. My fellow students and I enjoy an Asana class in the sun. Getting into the course, it was a blessing to only have 5 people in my group, and it didn’t bother me at all that I was the only male and aproximately double the age of my fellow students. Every day was intense, starting at dawn with yoga, pranayam and meditation before going into classes in Yoga Therapy, Yoga Philosophy, Ayurveda, Pranayam (yogic breathing) ,Yoga Asanas (poses) and teaching techniques. Every day we were also required to perform acts of Karma Yoga, selfless acts without expectation of reward. 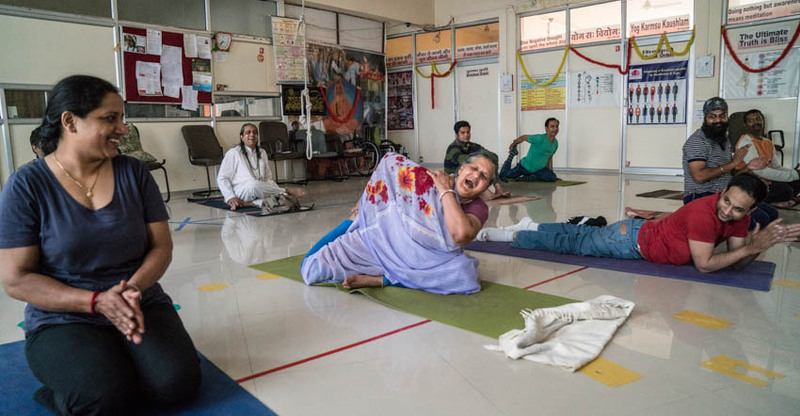 My photography became a key part of this practice as I documented all aspects of the Ashram life for my fellow students and the institute and by the end people were lining up to commission work. 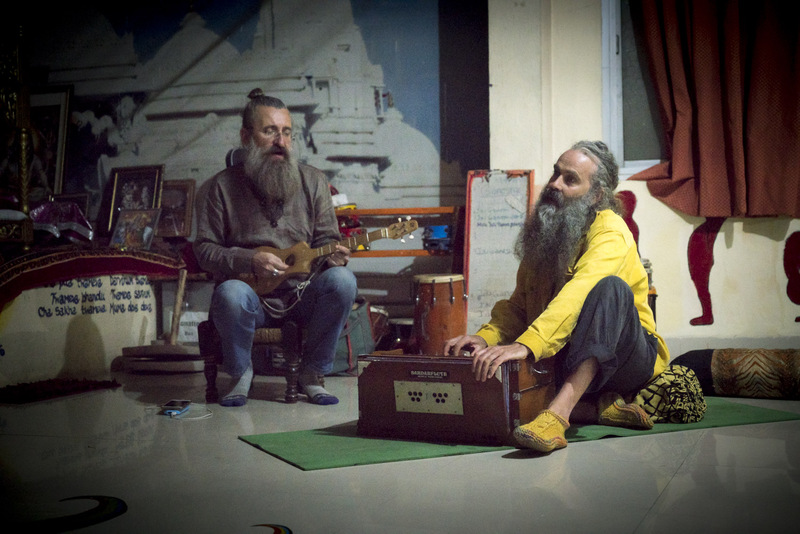 Each day finished with Bhakti Yoga, devotional singing and prayer which often became a fun and spirited jam session on traditional Indian instruments. Yoga Therapy. I assisted Moize with his yoga practice most days. Paralised from the waist down for 10 years he was starting to get sensation and strength back in his legs after a just a month of practice. Bhakti Yoga. Dr Nick Perch, myself and Ramon had many sublime moments on the traditional Indian instruments. The Ashrams founder and guru was Guruji, Dr Omananad, a charismatic, fun and deeply wise yogi who inspired all his students to do their best. The author of many books and the teacher of tens of thousands of students, his knowledge was steeped in the ancient traditions of Indian yoga. He never seemed to sleep and was always available to us to answer questions or deal with any concerns. On top of taking classes, twice a day he would lead us in group pranayam and mediation. These were always intensely physical and spiritual experiences; some students might end up crying hysterically, others laughing whilst others might go into involuntary full body shakes. I experienced all of these states at various times. Towards the end of the course Guruji issued us with a personal mantra and a yogi name in an ancient ritual. You can now call me Madhav Ananad- Divine Compassion- Sweet Bliss. 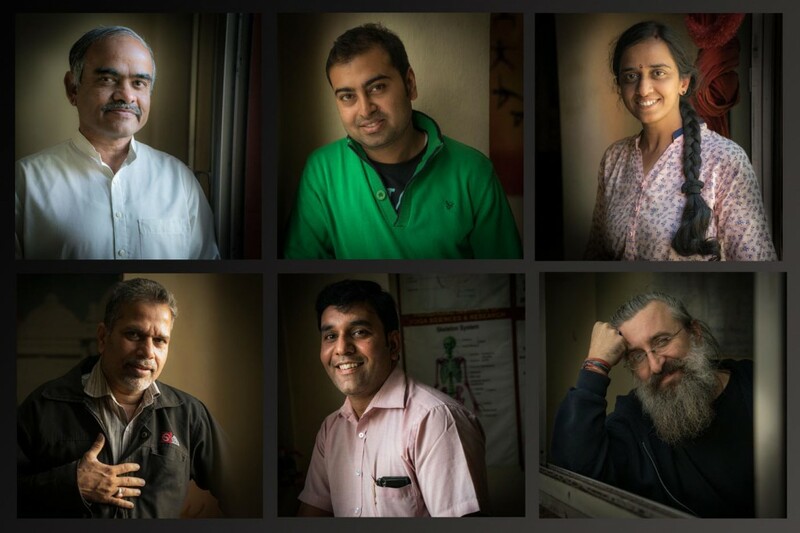 The teachers of Paramanand Institute of Yoga Sciences. I left the Ashram with my 200 hour teacher qualification feeling energised, inspired and ready to face the world. Arriving in Mumbai however, I discovered that my travel visa would run out just hours before my return flight, no hotel would allow me to check in and I spent the night on a couch in a hotel foyer wondering if I would be sent to prison. My mediation practice and recently learned prayer techniques had never been so critical as I slowly untangled the mess and negotiated my way through the chaos and confusion of Indian bureaucracy. Strangers came forward at key moments to help me out and although I missed my flight I left India the following day wiser for the experience. An intense group mediation in process. When this amazing old lady from a nearby aged care facility started coming to morning class she was obese and depressed. She is now half her size, full of life, loads of fun and insists on attempting every Asana. Back on Kangaroo Island Ky was definitely into the idea of having a yoga teacher as her boyfriend and I started taking her for classes straight away. Within a week I took my first real class, a group of seniors sitting in chairs at an aged care facility. I made them chant OM but spared them reciting the Sanskrit prayers and chanting Shanti. I think they all enjoyed the experience, only one student fell asleep. I loved it. 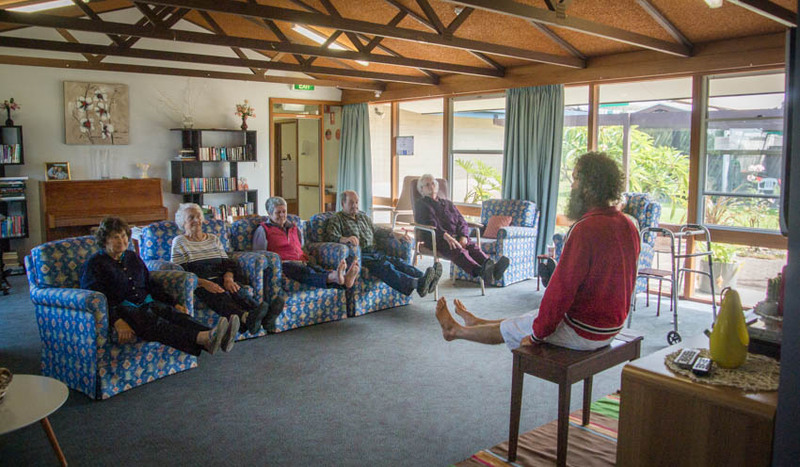 My first yoga class to the residents of Carnarvon Aged Care facility Kingscote. The Earth Gives Us Everything. My film Another Country premiered at the Melbourne International Film Festival and received a long standing ovation. For a documentary, and my first effort as a cinematographer, it has been exciting to watch it not only do well on the festival circuit, but pick up some amazing reviews and even get a cinematic release. I caught up with the film at The Adelaide Film Festival and stood with my director Molly Reynolds for a couple of what has been for her a busy circuit of Q&A’s and interviews. My family and loved ones caught the film at various places around the county and were full of praise, which felt great. I am very proud of Another Country and the supporting website Still Our Country. 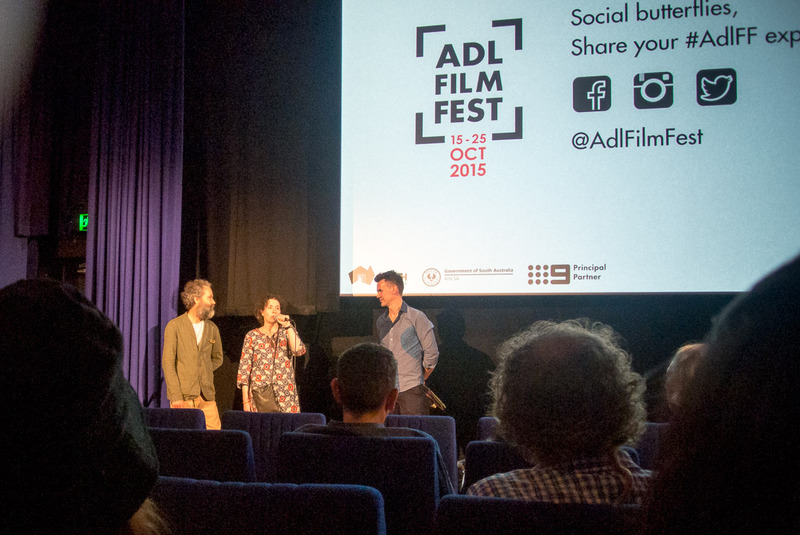 Molly Reynolds and myself take questions at the end of the Another Country premiere in Adelaide. It gets pretty cold and windy in winter here on Kangaroo Island, so I am particularly proud at having only slept in my house for a couple of weeks this year. Having a tent in the back garden as our bedroom has been a great decision, amongst many other things, freeing up a whole room in the house just for yoga and meditation! The bell style canvas tent glows magically by lantern light at night, the big winds and storms weave their way into my dreams, you feel the thud, thud, thud of kangaroo’s passing by and wake very morning to a chorus of native birds. My girlfriend Ky has been studying Eco Psychology and Eco Art Therapy this year and the whole family is reaping the benefits of her studies. 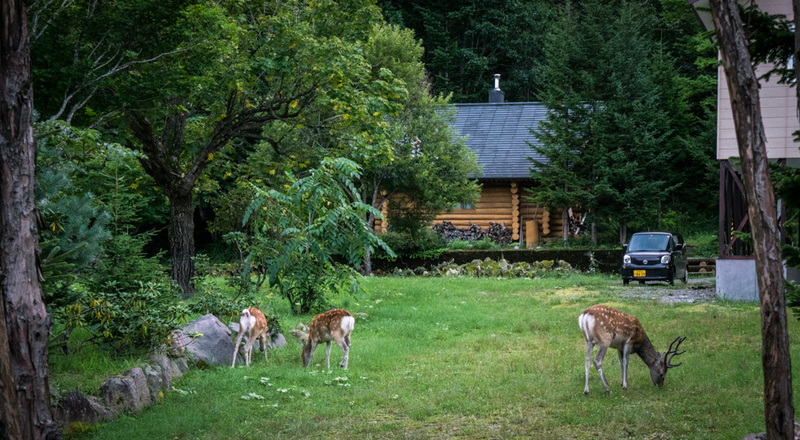 Connecting with nature and understanding the interconnection of all things are wise and healing teachings, made easier by the fact that I already live in a beautiful natural environment. I have always been partial to sleeping outside. Eco-psychology guru and Project Nature Connect founder, Dr.Michael Cohen, has apparently slept outside since the 1970’s, legend. My bedroom at Baudin Beach, Kangaroo Island. 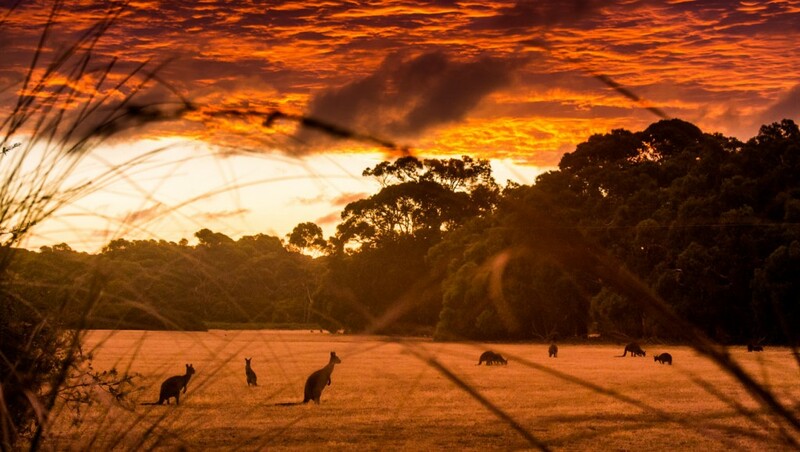 A time rich lifestyle on Kangaroo Island creates some interesting opportunities. Finding lots of enjoyment through my personal photo projects again, I set up a volunteer artistic residency at the islands Aged/Assisted Living facility Carnarvon. Over 2 months I got to know the residents and staff then set up a little portrait studio in the common room and invited them in. The residents brought along a chair or other special items from their rooms for their sitting, and later on worked with me to select their favorite shots, and order prints for their families. I loved this project and these dignified portraits, that now hang in the entrance foyer of Carnarvon. 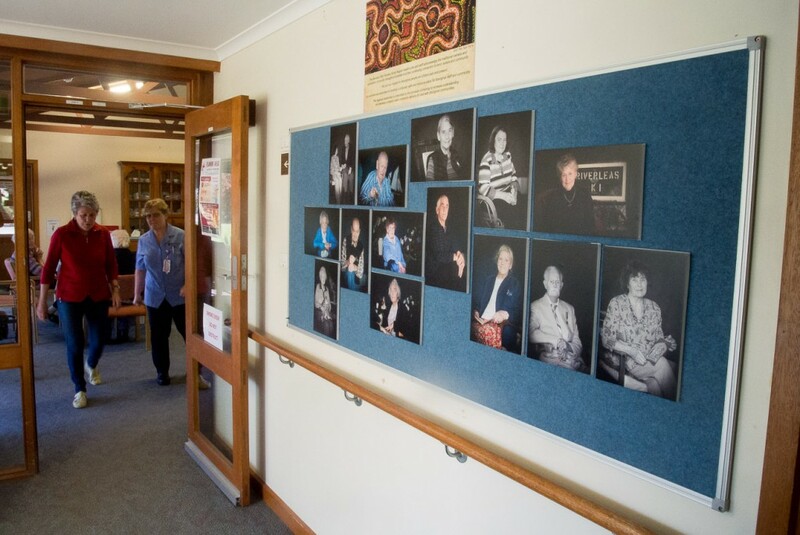 My portrait display, The Residents of Carnarvon in the entrance foyer. Together with Ky and my neighbor Angie Watkins, we held an exhibition at our local gallery Artworks titled The Earth Gives Us Everything . Ky unveiled her stunning Tari landscape series that she has been working on since we moved to the island. Angie took her wand making to a new heights, working with materials mostly found on our beach, for what was her first ever art exhibition. My photography also stayed with a local theme. I took family portraits of the majority of my community here at Baudin Beach, a great opportunity to get to know the locals and further develop a portrait series that I have been working on since moving to the island. Never a great landscape photographer, I challenged myself to try and capture something of the beautiful and dramatic places that surround me, juxtaposing a selection of these with my portraits. Working only with local materials I also weaved a few bits and pieces, including my first pair of woven thongs. 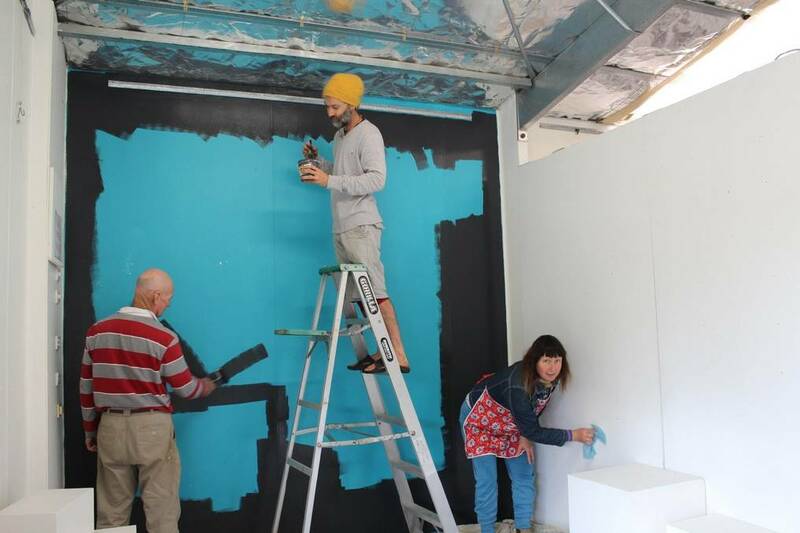 Ky, Wren Lashmar and myself prepare the walls at Artworks for our exhibition in this publicity photo by Anne Lashmar. 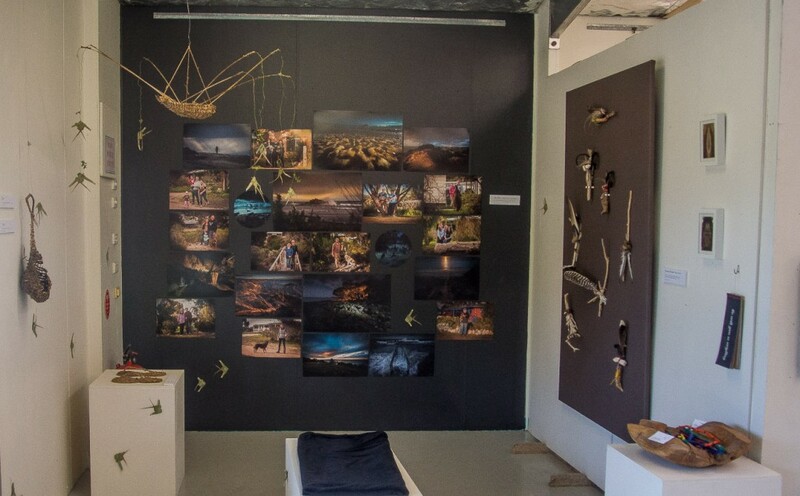 Local landscapes and portraits from The Earth Gives Us Everything exhibition. My exhibition of weaving and photography at Artworks. Also at the Artworks gallery I taught my first basket weaving workshop which attracted strong interest from my community. 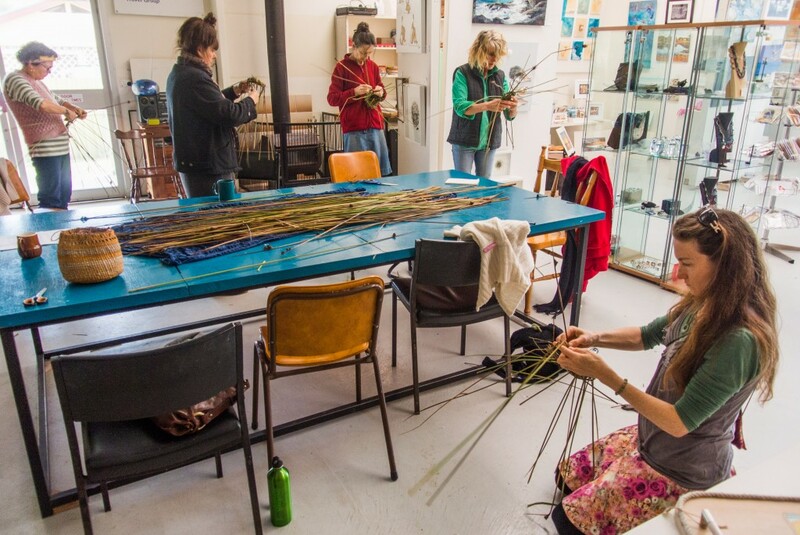 My students got to learn the basics of wicker weaving using local sedge’s and rushes, and it went well, everyone walked away with at least one little basket. Part of a series of Winter Workshops concieved by Ky, I was fortunate to participate in all three of her fantastic Art Therapy workshops. We both now spend time working at this community gallery that represents many fine artists from around the island. Participants at my first basket weaving workshop in action. It hasn’t been all beach walks and fine food, some work did come up and I ducked off to Canberra to spend a week working on Secret City, a futuristic political thriller. Having had some time away from on set stills photography it was really fun to get back into it and I enjoyed the work and travel. Having been a NIKON man for the best part of my career, this project marked my first job working with a SONY camera, the AR7 2, which had just came on the market. Being able to take high resolution stills completely silently up till now has required the use of a camera blimp , a silencing box that goes around the camera and lens, an obscure and heavy accessory used almost exclusively by us stills types. The era of the sound blimp was always going to come to an end with the advent of digital photography, but it has taken its time for this technology to get up to speed for use in my industry. It was liberating to finally be able to reduce my equipment to one light camera body and a couple of lenses, and give my body a break from a career of heavy lugging. Jacki Weaver in Canberra for Secret City. A great warrior has left this world. Ramindjeri elder Karno Walker was a traditional lore man, story teller, activist and fighter. 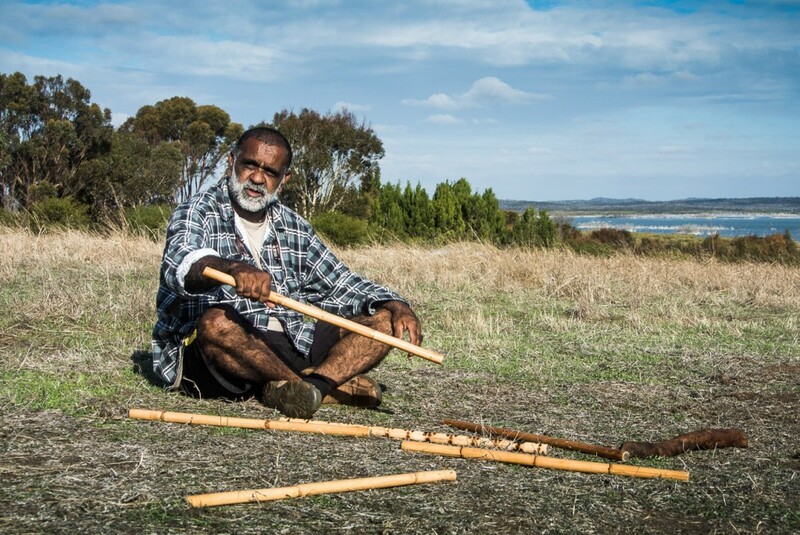 Karno had spent the last few years in court fighting for sovereignty on behalf of his people and all Original Australians.When my family arrived on Kangaroo Island (Karta) 2 years ago we went first to Karno and Christine’s place (Wulde Wurri – Eagles Nest) that sits above Murray Lagoon. He surprised and honoured us with a welcome to country ceremony in traditional dress, setting up what has been a great relationship with this land. His friendship and teachings have been a special part of our time here. 2 weeks ago we were again with Karno and Christine at Wulde Wurri for a Mum:oo:wee ceremony, 4 days of talking and healing that attracted people from all around the country. I will miss this unique and powerful man and honour his passing on of knowledge and stories, towards more understanding and greater peace on earth. After a extremely hectic period in the local film industry things quieted down somewhat, but when director Matt Saville brought his feature film A Month of Sundays to Adelaide I was invited to shoot stills for a couple of weeks. The dark comedy entered the world of real-estate agents, with Anthony Lapaglia and John Clarke doing a fine job in the lead roles. It was a fun project to be involved with, working again with close friends on the crew, and John Clarke and I had an instant connection over our fellow passion for bird photography. 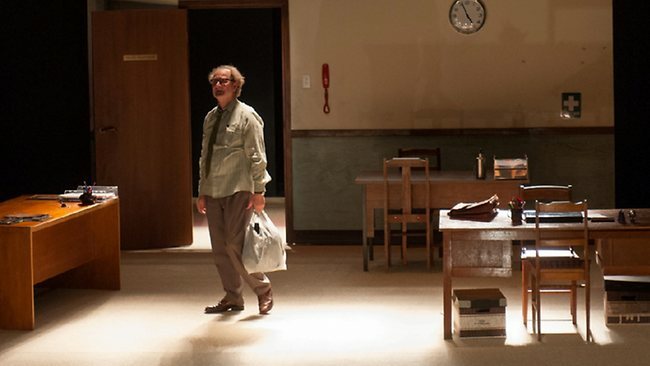 Matt Saville, Anthony LaPaglia and John Clarke on the set of A Month of Sundys. A very moderate work load suited me fine allowing me to get stuck into my personal projects and studies. In my mid 40’s yoga has become a huge part of my life, but with no suitable classes or teachers on the island, I am required to develop my practice with reading and classes on DVD’s. My busking show is also getting a re-working over this period. The circus show, with juggling, uni-cycling and free standing ladder tricks was already challenging and scary enough, so I am not sure why I decided to try and do it all on a table! 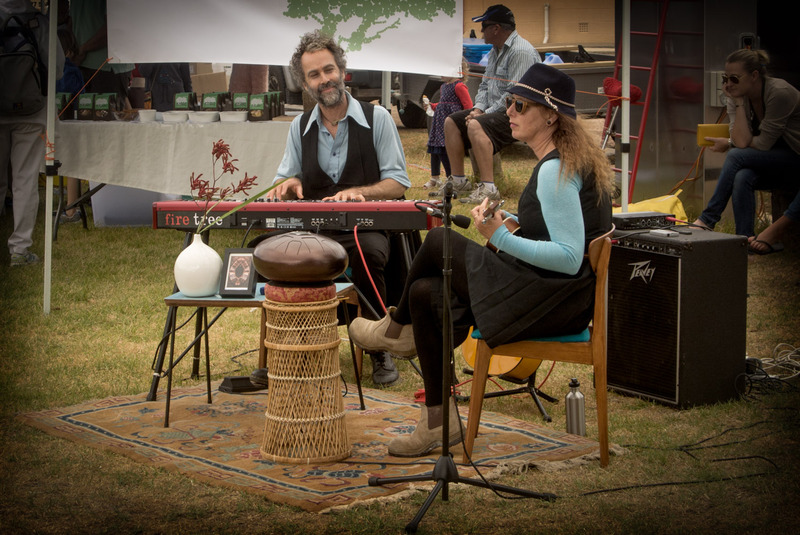 My band, with girlfriend Ky, is now called Kinyeri, from the Ramindjeri word for the iconic Yacca plants that grow all over the island. We have been performing regularly and have just released our first recordings on BANDCAMP. Also challenging me and giving me a lot of fun, I bought a little Laser sailing boat. Having grown up on yachts, getting my skills back up whizzing around my bay, occasionally joined by a pod of dolphins, and regularly getting chucked in the ocean, is huge fun and makes me, and the occasional brave guest, feel completely alive. Kinyeri performing at Penneshaw community market, Kangaroo Island. My basket weaving alter ego Basketboy had his big day in the sun over the Easter period. The annual Easter Art Competition in Penneshaw is a big deal on the island, with large cash prizes and most of the islands significant arts community getting involved. It was a huge surprise when I won my category with a selection of small baskets that represented the various places that I had lived on the island. I sold the work, had my photo in the local paper and got lots of respect and praise from my community. The win seemed to coincide with all of my baskets and rattles being sold in the islands major gallery KI Fine Arts. 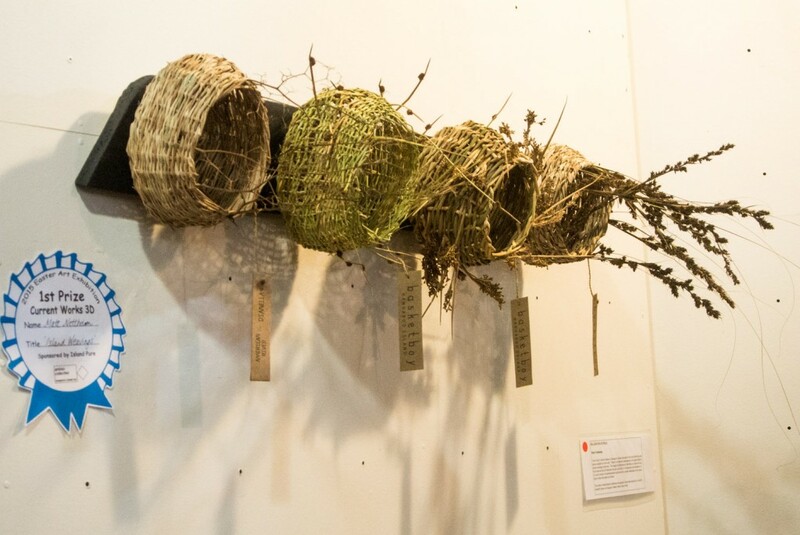 The gallery is now very keen for me to keep them stocked up with my weaving’s and I have even been invited to give a weaving demonstration at the upcoming Parndana Show. I hope they can handle the excitement. Island Weavings. 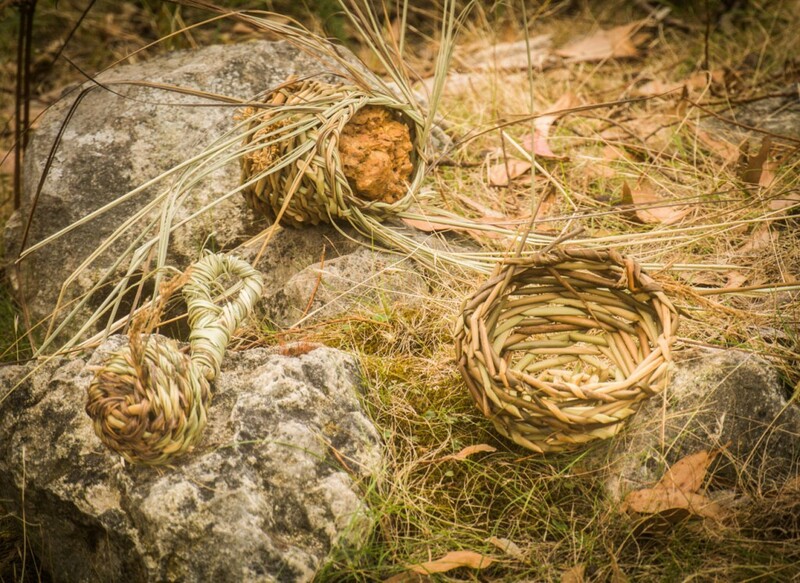 A series of baskets using the variety of natural materials that I have been working with on the island. 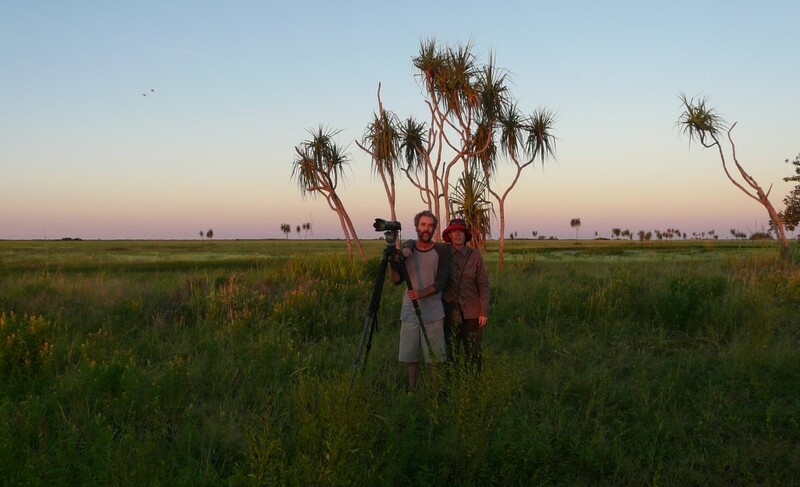 It has been a couple of years since I was up in remote indigenous community Ramingining, in Australia’s Northern Territory, working on the film Charlies Country. The film was released over a year ago and was very well received, including getting a best actor award for David Gulpilil at Cannes. It was another remarkable achievement, working under extremely challenging circumstances, by my friend an long time collaborator Rolf de Heer. Whilst working on the film I divided my time shooting a documentary with Rolf’s partner Molly Reynolds. The results of this were 2 feature length documentaries and a stunning web site, Still Our Country. Whilst the more experimental documentary, also called Still Our Country, was selected to screen at last years Melbourne International Film Festival, the second project, Another Country has now been include in this year’s official program, and I have been invited to attend and take part in the Q&A. I am just so proud of this documentary, my first credit as a cinematographer, and it will be interesting to see what new challenges arise from its release. An oyster farm and a cat skinner. 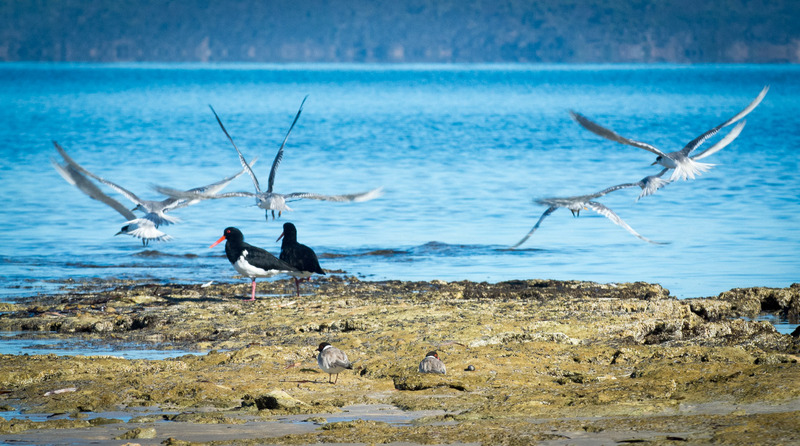 I settled into life on Kangaroo Islands remote south west coast, an indulgent and blissful period living close to nature. As money ran out, a television job in nearby Adelaide came up, so I commenced 9 weeks work on Deadline Gallipoli. Having recently worked on Anzac Girls, the Foxtel project put me back in World War 1, with some impressive actors in the leading and supporting roles. We shot through through a cold and rainy South Australian winter. Fortunately I was amongst a great group of people, colleagues from countless productions, a hard working world class film crew. I was kept busy doing all my usual stills photography job as well as shooting all the hero photographs on behalf of the photographer lead character that feature throughout the show. Back on the island, our family decided to pack up the log cabin on the stunning Stun Sail Boom River and prepared to move. Living on the enormous bush property, with its private river and secluded coastline, had been a beautiful time in our lives, and inspiring creatively. Ky has been the busy photographer in the family, her Yoni Landscape series gets more stunning as she goes along. Such a multifaceted artist and human being, she has just launched her new website kyalecto.com and has started practicing her art therapy on the island. Our Kangaroo Island adventure continued with a house sit in town of American River. With an oyster farm and a cat skinner, a shop and post office, the little town has a diverse and interesting collection of people. It had dawned on me late to start taking photographs of my new friends on Kangaroo Island, so I wasted no time. Portraits and community photo essays have always been my thing and I am really enjoying this series, meeting up with some great people and giving them the photos. Lara, Jeanie and Rusty. From my Friends on the Island, so far-portrait project. 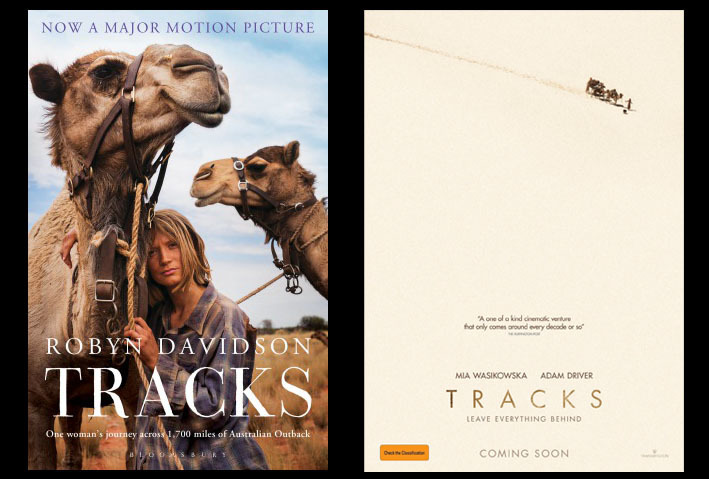 The movie Tracks opened in the US, and alongside the release a beautiful photography book was launched. 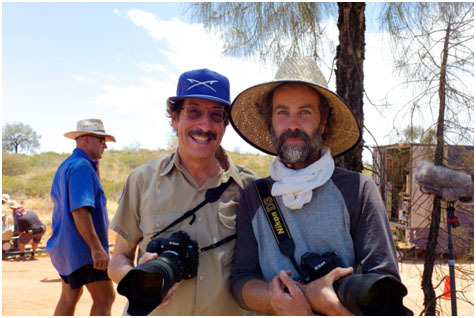 Rick Smolan, the actual National Geographic photographer on Robyn Davidson’s epic camel journey in the 1970’s, had done all the hard work, bringing his stunning old negatives to life with modern scanning technology and putting together the book. We met on set in Central Australia, had got along well and it had been great working with him over the project. Stills photographers dream that a making of book comes out from all the films we work on, but these days they rarely happens, which makes it really exciting when it does. The large format, high quality interactive publication features a combination of Ricks original photos and my on-set portraits and stills, and Rick sent me with 45 copies of them! Inside Tracks, Rick Smolans book with lots of my stills in it. 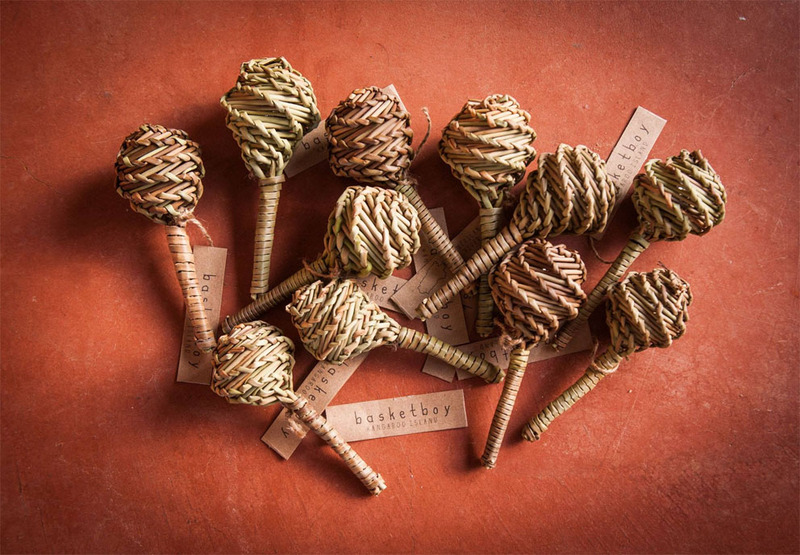 Summer is the busy tourist season on Kangaroo Island, and Basketboy’s big time of the year. I have started performing my busking show again and have been basket weaving most days, making stock for my monthly market stall. 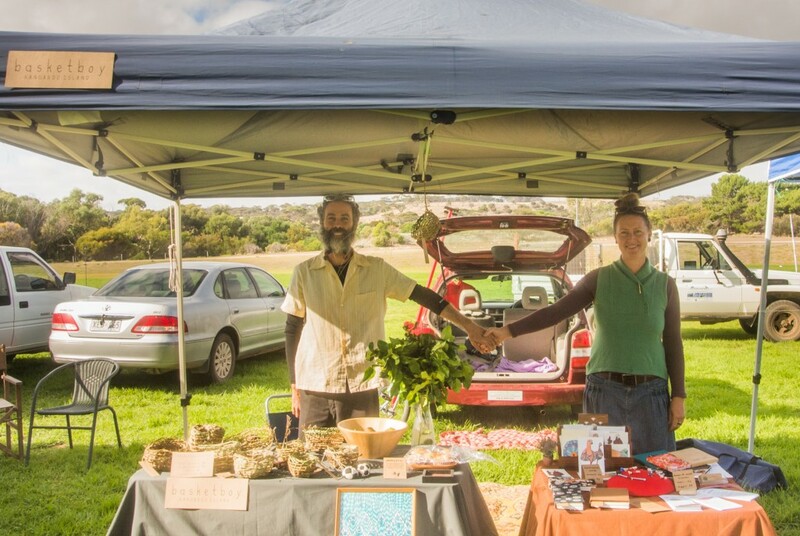 The Rustic Blue Gallery and Kangaroo Island Fine Art Gallery have also started selling some of my woven creations and a friend ow sells them at a market stall on the mainland, the empire grows. For me, the woven baby rattle has been a calling, as well as a great weaving challenge. My own baby rattle, purchased somewhere in England in the 1960’s, was the inspiration, and after to weaving vast numbers of these traditional baby toys, most not suitable for children, I am finally getting close to mastering the Spiral Weave Rattle of my youth. Spiny Rush Spiral Weave Baby Rattles ready for market. When our American River house-sit came to an end we needed somewhere new to live. 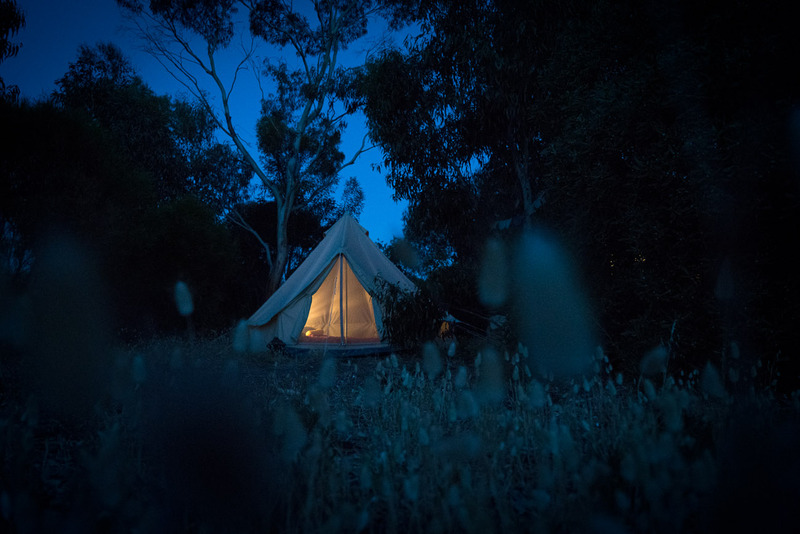 A pretty beach house with lots of trees and a big shed came up for rent and we moved into the sleepy seaside town of Baudin Beach, Kangaroo Island. With a gorgeous private beach in our backyard and a staggering collection of local birds, the house was also available for sale and after a short time it just seemed dumb not to buy it. Baudin Beach, my new backyard. The autumn days on Kangaroo Island have been gorgeous, and it has also been one of the more interesting periods of my life. I launched my basket weaving business BASKETBOY at the islands Penneshaw community market, and actually sold a few baskets and rattles. It had been a long standing dream of mine to have a market stall, it was a really fun day and I met lots of great people from my new community. With Ky Alecto, the BASKETBOY launch at Penneshaw Community Market. At the same market I pulled off my first solo busking show, also under the name BASKETBOY. 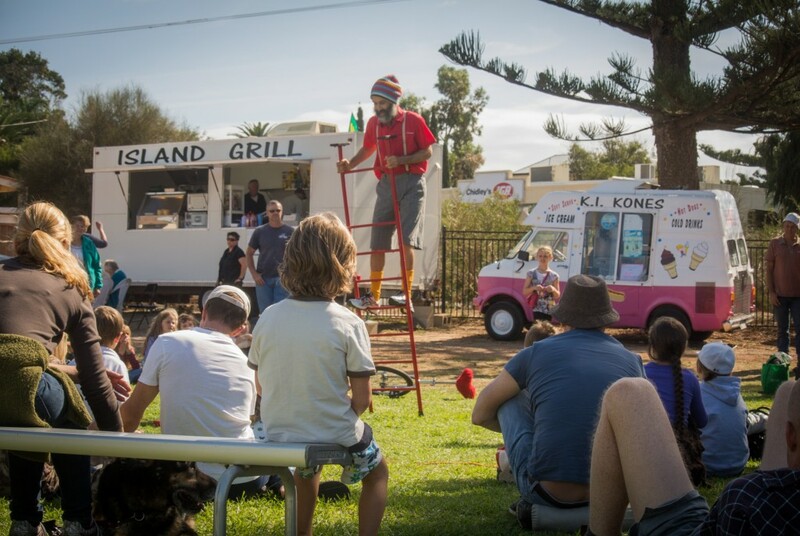 My circus show, featuring uni cycling, juggling and free-standing ladder tricks, was well received by a small but enthusiastic crowd of locals tourists and dogs. Training hard in the lead up to this show, I finally achieved a 5 ball juggle, a serious challenge that had taken me almost a year of daily practice. French Circus Ladder on grass at the community market in Penneshaw. I was asked to play music at my favorite local restaurant, Yellow Ash and Chili in Kingscote, during the islands FEASTIVAL food event. It was my first solo gig as a piano player, I enjoyed playing my songs for a couple hours, and my family and I were well fed. 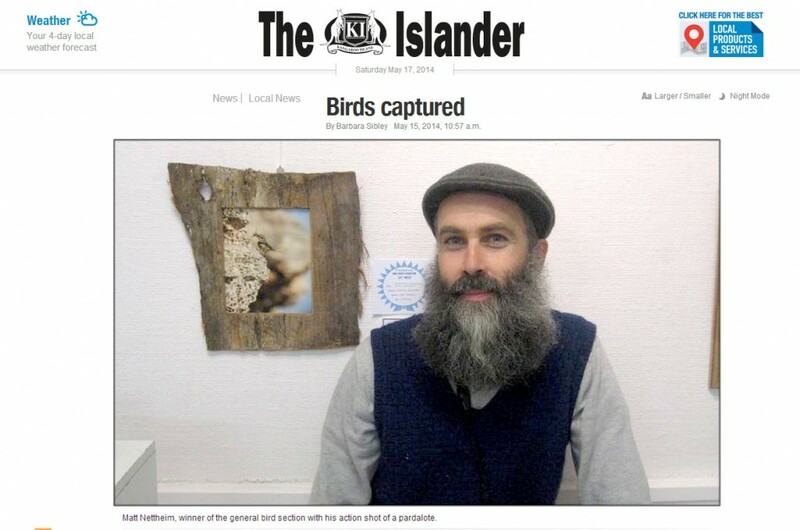 Definitely in no need of any further ego stroking, I then won first prize in the Kangaroo Island Bird Photography Competition, and even had my photo in The Islander newspaper. This beautiful place has been so good to me. Kangaroo Island supports a small endangered population of Glossy Black Cockatoos. In the 1990’s it was estimated that less than 200 birds existed, since then sustained monitoring and protection programs have seen this number increase to around 300. It is a slow process, the Glossies, that mate for life, only lay one egg that is always under threat by hungry possums or other birds competing for the nest hollow. With one of the better jobs that I have come a cross, Mike Barth monitors over a hundred nest sites around the island and records all the data. I joined him for a beautiful evening of nest watching. Mike Barth in the field with female (left) and male Glossy Black Cockatoos. It was exciting to have two films that I worked on selected to compete at this years Cannes Film Festival.The Rover and Charlies Country both got the nod and went quickly into publicity mode. It was interesting to see both films go with one my close up portraits as their poster, two of my favorites of recent years. The Rover has continued to drip release some beautiful stills in a very classy social media build up to the premiere. 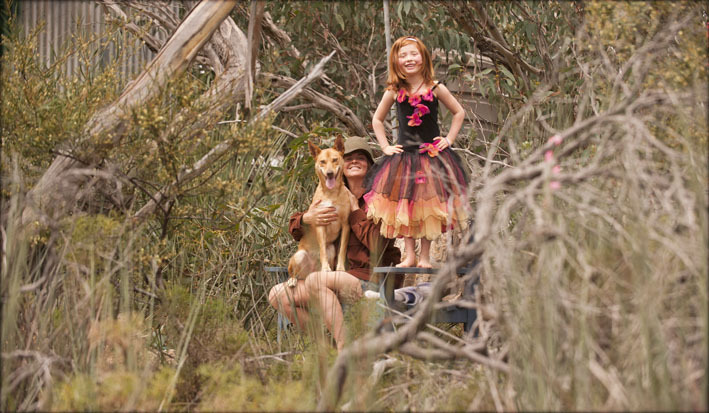 And so I moved to Kangaroo Island with my girlfriend Ky Alecto and her kid Yeshe and Joy the dog. The house we are renting sits on 3000 acres of beautiful Australian bushland, bursting with native animals. A beautiful river winds through the property to a secret beach on the islands rugged south west coast. It has been a very easy transition for me from a lifetime of city living to a remote country lifestyle. Each day is greeted with yoga and mediation, perhaps then a canoe or bike adventure, fishing, weaving baskets or just doing nothing. Always eating well. Our possum and wallaby proof vegetable garden is starting to yield, and I have gone back into daily training with my circus skills. Kangaroo Flat, my back yard on the banks of the Stun Sail Boom River, Kangaroo Island. This period has seen several of my recent film projects getting busy. 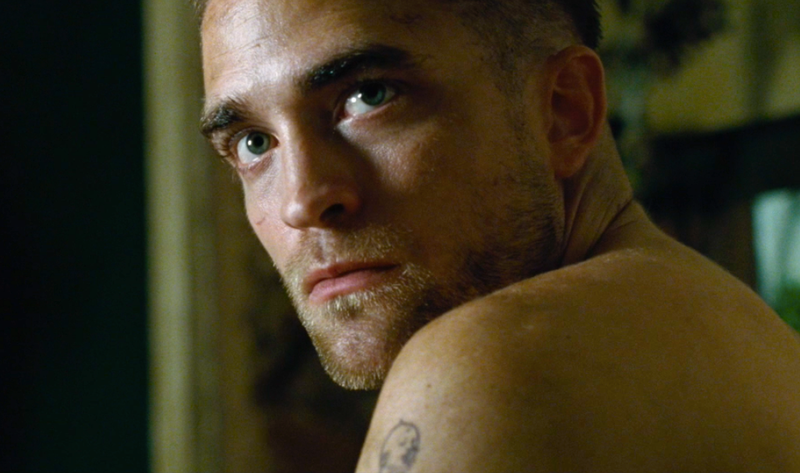 The Rover released one still almost a year ago, with a huge public response. My web site, good for about 4 hits a day, hit over a thousand that day, largely thanks to Robert Pattinsons enormous fan base. There has been nothing else released for almost a year, and now a bunch of new stills and a trailer have sparked big interest. Its a really exciting film to be involved with. The movie Tracks had it international premiere at the Toronto International film festival and has re-branded the original book with one of my portraits as its cover. It was great to see the film go with a wide landscape still for their poster, one of the shots I took on film with my Hasselblad camera, an image that captures the beauty and journey of the film well. I caught Tracks at a cast and crew screening in Adelaide. A personal highlight was seeing Mia Wasikowska weaving a little natural basket on screen. I had been giving her a couple of lessons on set and she just kept on going and worked it into the scene. I was delighted it made the cut. Mia Wasikowska and Rolley Mintuma in Tracks. Mia holds the basket that she was working on that day. 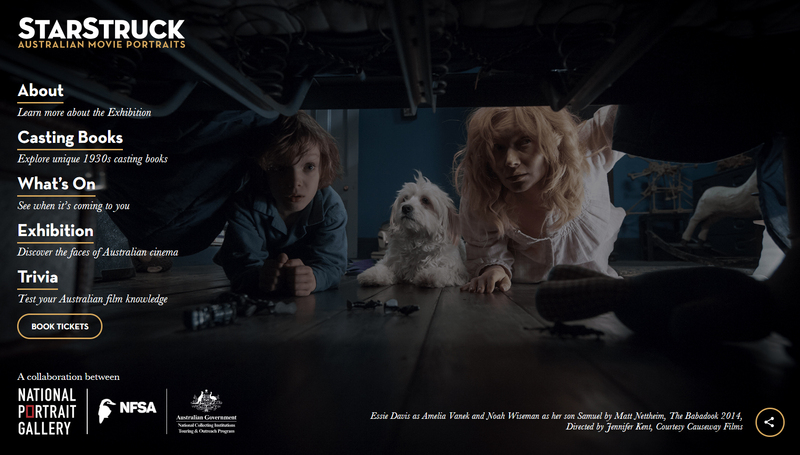 The Babadook premiered at the Sundance Film Festival, and this low budget horror film had a big impact on international critics and the festival audience. It had been an intense shoot, ridiculously ambitious for its tiny budget, but the passion and skills of the writer/director Jenifer Kent and the commitment and raw talent of her actors ,Essie Davis and 6 year old Noah Wiseman, seems to have achieved a great result. The Babadook. Noah Wiseman and Essie Davis. A bunch of my stills will be featured in the WOW film Festival this month. The festival celebrates woman in film and my stills have been featured on the festival poster and the stills exhibition invite. 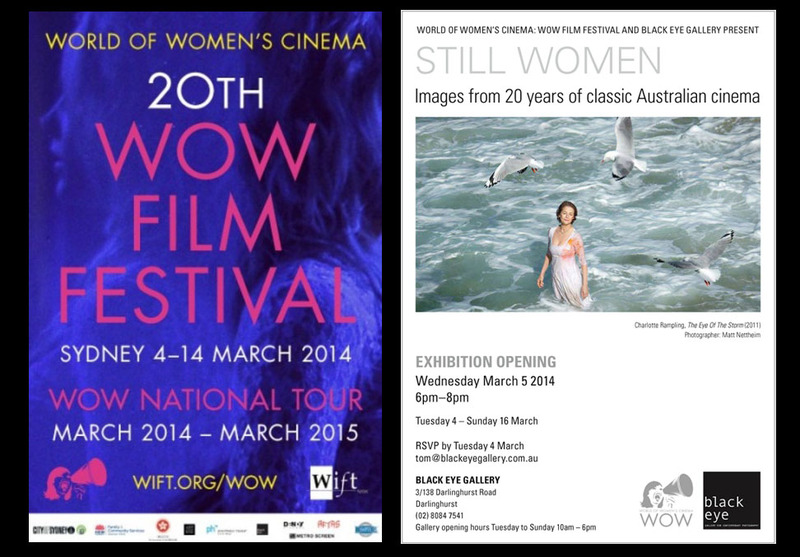 The WOW film festival and stills exhibition, featuring stills from Somersault and The Eye of the Storm. As a basket weaver it has taken a little while to get to know my new place; finding suitable weaving materials around the property and learning what they do. I have been working with long grass and a couple of varieties of reeds that grow along the river. Most days get a chance to head off and harvest materiels or to sit and weave at my special spot by the river. A collection of woven rocks, rattles and a variety of baskets are starting to come together. I sit on the threshold of launching my basket weaving label and products to the world at the Community Market in Penneshaw next month. I am really hoping for a little article in The Islander newspaper, and it would be great to get some of my work in one of the island’s galleries. 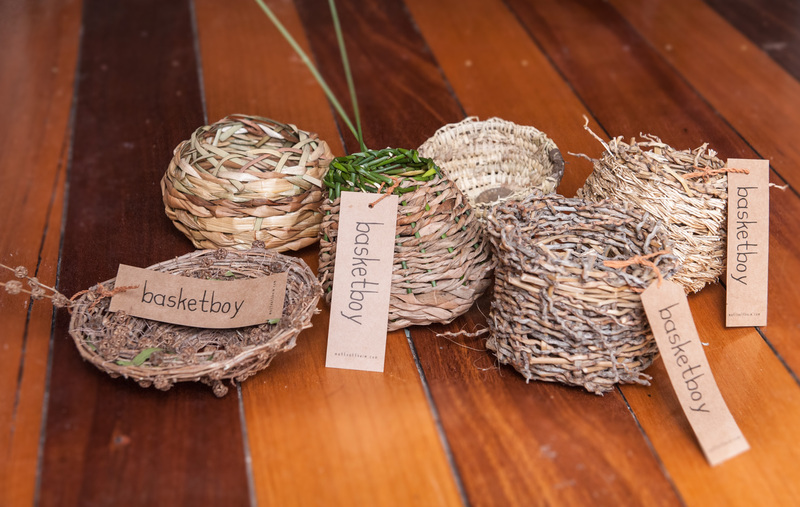 Is the Kangaroo Island ready for Basketboy? A woven rock (laterite), rattle and basket from my Stun Sail Boom River series. 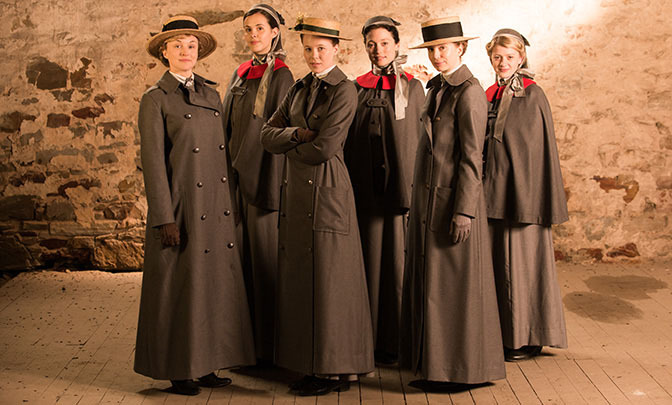 Good work in my home town Adelaide continued with Anzac Girls, a stylish period drama that depicts the real stories of Australian and New Zealand World War 1 nurses. 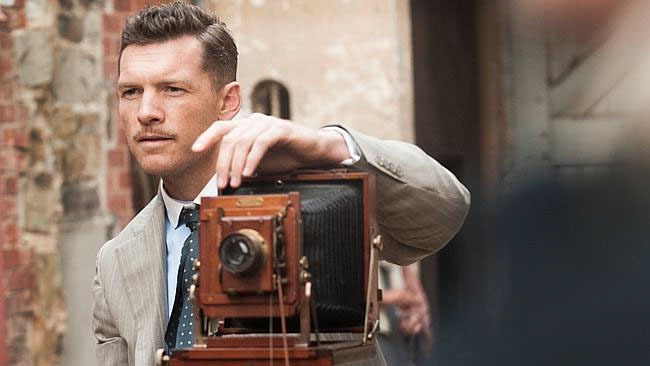 With a cast of young talented actors, many big scenes and fantastic sets, the ABC TV financed production would be the first of several World War 1 projects kicking off in Australia as the centenary of the start of the conflict approaches. It was a visual treat for stills and fun to work on. The cast of Anzac Girls. My oldest and closest friend Aidan Munn, has been a professional dancer his whole career, now doing more choreography, music and teaching. 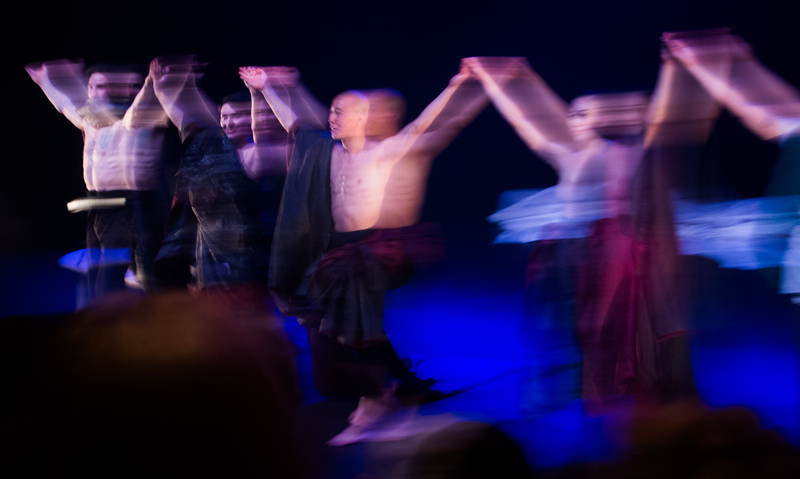 Aidan thought he had retired is tired body from the stage years ago, but his lifetime collaborator, choreographer Leigh Warren, polished him up for one more show, Not According to Plan, part of the OZASIA festival in Adelaide. It was great to see this him on the stage again, a unique and charismatic performer always. Not Acording to Plan – Dancers Aidan Munn, Bec Jones,Chien-Wei Wu and Yuan-Li Wang at the end of the show. Aidan also recently qualified as my first close friend to become a grandfather. His son Aithlea and his partner Mimi had a beautiful girl Mira, who I met and held. The birth gave me an excuse to attempt to weave my first baby rattle. The baby rattle is a classic traditional weave with several variations. I have been weaving one a day to get my skills up, certain that I have finally found the key to my fortune. Early attempts at weaving baby rattles. The State Theatre Company of South Australia kept me busy shooting head shots, their upcoming production Maggie Stone, as well as their current production Vere (faith). Vere was great theatre, written by John Doyal, lead actor Paul Blackwell supurb in the lead role. I bought tickets for all my friends to see it. Paul Blackwell in Vere ( faith). The Adelaide Film Festival premiered 2 feature films that I had worked on. The festival opened with the Australian Premiere of TRACKS. The films real life subjects, adventurer and the original book’s writer Robyn Davidson and Photographer Rick Smolan were in town for the occasion. Rick and I met on the set of Tracks and connected well as friends and photographers. It was great to see him again, and exciting to discuss the possibility of doing a TRACKS book together. Rick Smolan and myself on the set of Tracks. Charlie’s Country also had is world premiere at Adelaide Film Festival, and this time I got an invitation to the opening. With all my colleagues and the cast in attendance, it was a great occasion. My amazing friend and collaborator Rolf de Heer once again creating a huge film making challenge for himself and pulling it off with stunning results. It was a great film and got voted Best of the Festival. 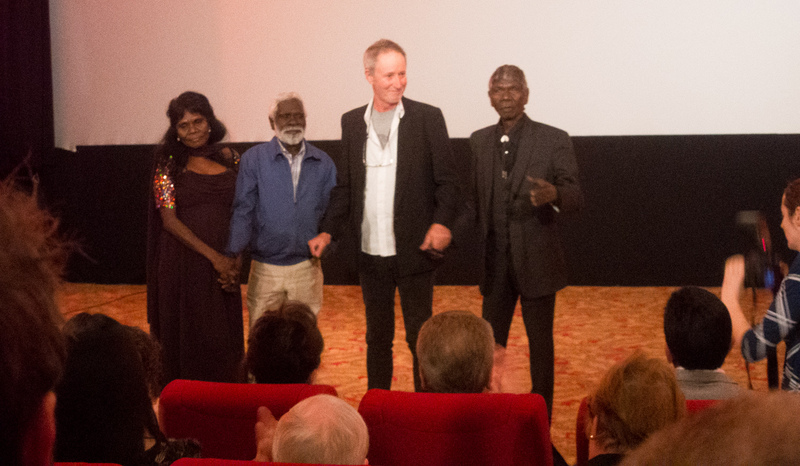 Jennifer Budukpuduk, Peter Djigirr, Rolf de Heer and David Gulpillill recieve applause at the end of the premiere in Adelaide. I started shooting the documentary, Another Country, when I was on location on Charlies Country in Ramingining. The projects director, Molly Reynolds, had found the time to view and log the footage I shot on multiple cameras with dubious sound, and it was time to head back up for a week of pickups. A long day of hard four wheel driving from Darwin, in Australia’s Northern Territory, it was a pleasure to visit this remote and fascinating community once again and re-connect with some of the friends we had made. The shooting went well and the project now heads into the editing room, my first job as a Director of Photography. 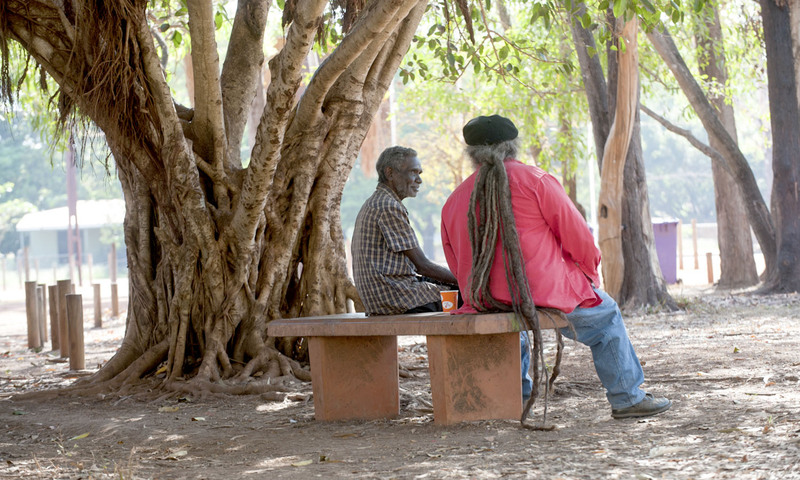 Artist and musician Bobby Bununggurr talks to former Bulla Bulla Arts curator Djon Mundine, Raminginning. 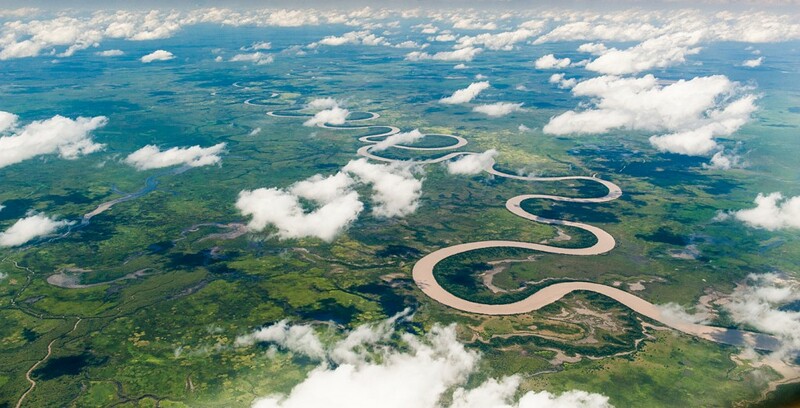 Arnhem Land, in Australia’s Northern Territory. My most exciting and exotic career moments have come from the 6 films I have worked on with writer/director Rolf de Heer, and Charlie’s Country was never going to be anything different. Our tiny crew, plus lead actor David Gulpilil, boarded a light plane in Darwin and took off for 6 weeks in the remote Aboriginal community of Ramingining, in Arnhem Land in Australia’s Northern Territory. Accommodation was scarce so actors and crew lived and ate together in the community guest house. We commuted around in an assortment of battered four wheel drives, salvaged and maintained by our busy crew mechanic. Rolf de Heer directs David Gulpilil and Peter Djiger on location in Raminginning. Everyone had taken on extra tasks to keep crew numbers down; I was there to do the stills and behind the scenes video as well as shoot a separate documentary about the community itself. This project had me teaming up with, Molly Reynolds, whose documentaries and on line components for the film 10 Canoes, http://www.12canoes.com.au/ , had won her international awards and acclaim. Our daily adventures often started in the town park, we’d meet locals and follow stories, happy to provide a taxi service for anyone who asked as we explored the community and landscape, infested with massive crocodiles. Molly Renolds and I at work on the flood plains near Raminginning. As a keen weaver, I could not have found a more inspiring place to spend a block of time. 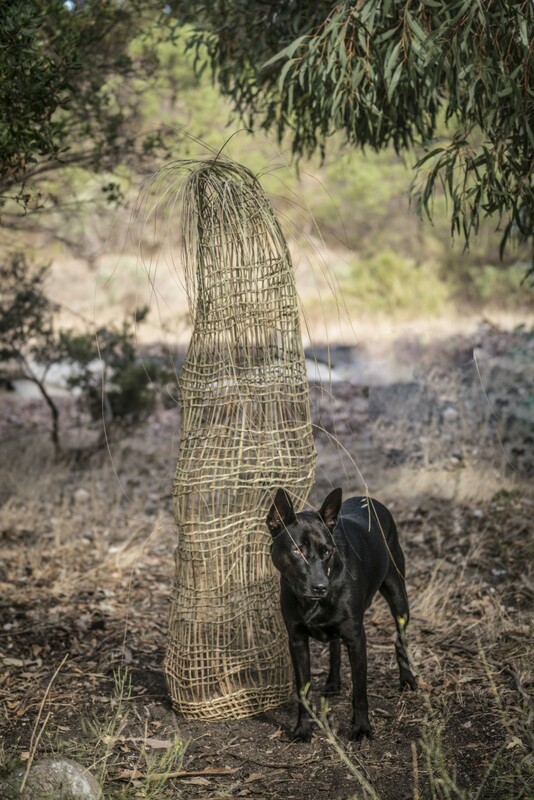 Basketry and weaving were deeply intertwined with the lives the Yolngu people, techniques and traditions dating back 60,000 years. They weaved predominately with leaves from abundant Pandanas trees, stripped, dried and dyed with vibrant pigments sourced from the local bush. Very soon after my arrival I organised to sit with master weaver Mary Dhapalany, twin sister of our lead actor David Gulpilill. She got me started on a dilly bag using a very intricate technique that would keep me busy for weeks. 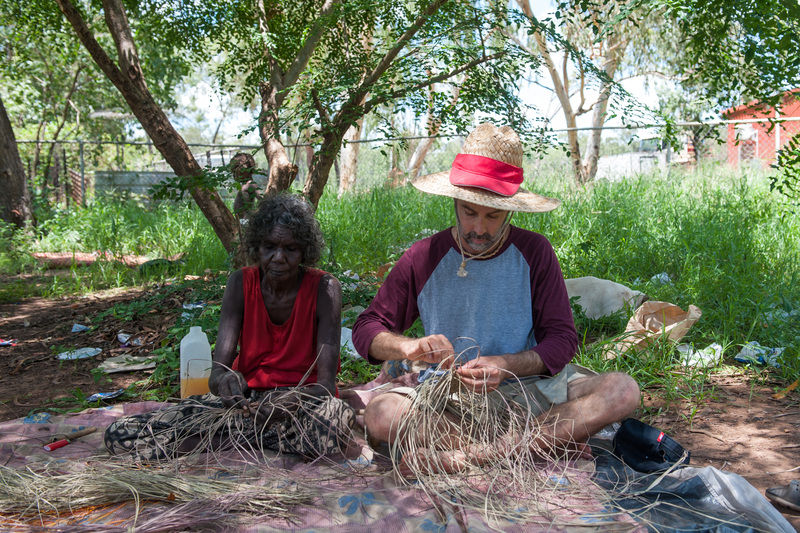 I was privileged also to sit with actress and artist Francis Jubiling, learning a variety of other traditional weaving techniques as well as string making from the bark of the Boab tree. Weaving lessons with Mary Dhapalany in Ramingining. When Charlie’s Country wrapped in Darwin it marked the end of an intense period of film stills work, 4 films back to back, all of them away, so I was very ready to get back to my special people in my home town. In Adelaide the local film industry was still as busy as I had ever seen it and I immediately started casual work on the television show Sam Fox : Extreme Adventures. I have done very little television stills work, it requires a different style of photography and the fast pace in which they shoot TV makes getting any shots at all a challenge in itself. The Sam Fox crew was made up of all my old friends, people I had worked with for decades, and the young lead actors were fantastic. A committed lunch time hacky sack crew was soon established, turning a good job into a great one. Celebrity Hacky Sack. Many of the actors on my recent film projects have been up for a hack. Its great to be home and have some time to do other things than just work. 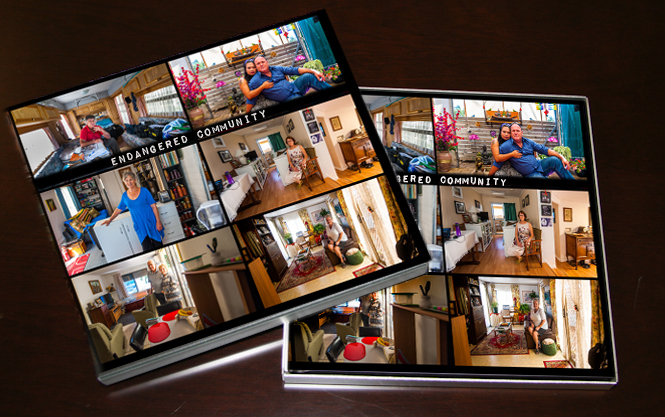 My girlfriend Ky and I completed our first collaboration, a book called Endangered Community. The fight against an aggressive eviction by local council still goes on for the permanent Residents of the Brighton Caravan Park, as this close and delicate community try to save their homes. We are really proud of our little book and it was great to meet and work with this lovely community, they certainly appreciated our support and creating this record of their threatened lifestyle. Endangered Community. My first book collaboration with Ky. 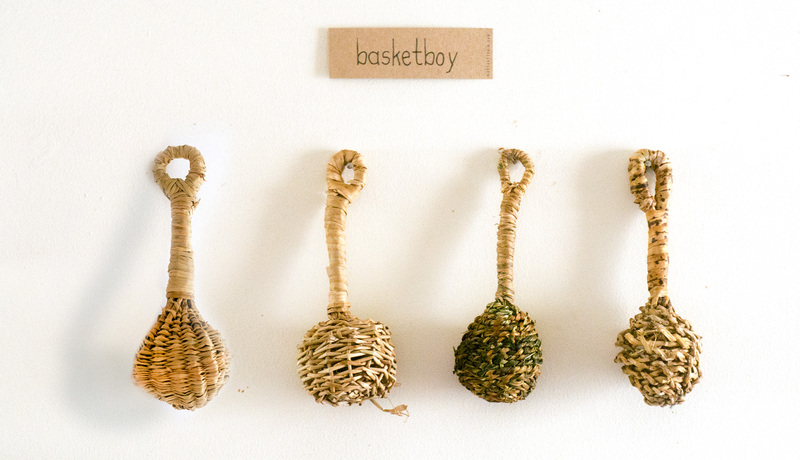 I also launched my basket weaving label, basketboy, this month. Still as obsessed as ever with weaving I keep myself busy working away at a series of small baskets using natural materials sourced from the western suburbs of Adelaide. Basketboy. My series of small urban baskets. The stills photography community mourned the loss of a colleague, John Bramley last month. An outstanding talent, John came from New Zealand and made it to the very top of the stills game, living in California and notching up an impressive list of film credits over two decades including the Spiderman trilogy and the Twilight films. Johns accidental death on location in India brought home to all of us the dangers associated with travel and working long hours, and the importance of spending time with our loved ones.